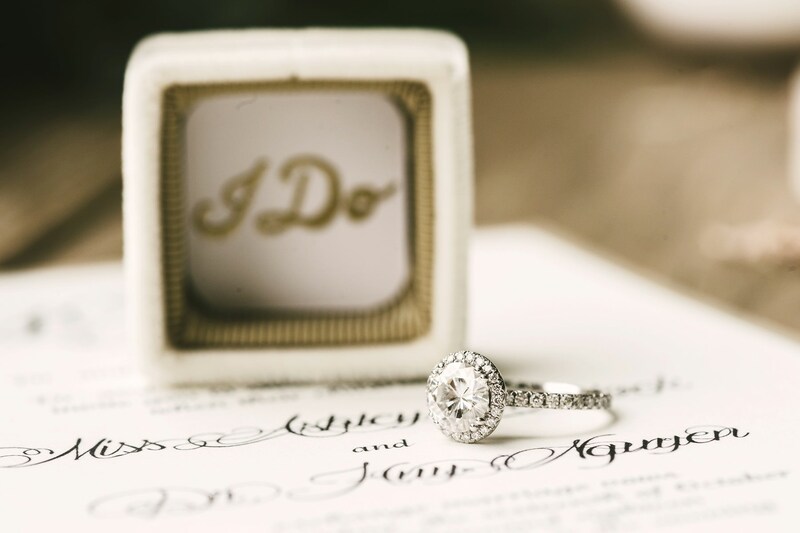 Imagine you have been planning your elegant wedding since when you got engaged. 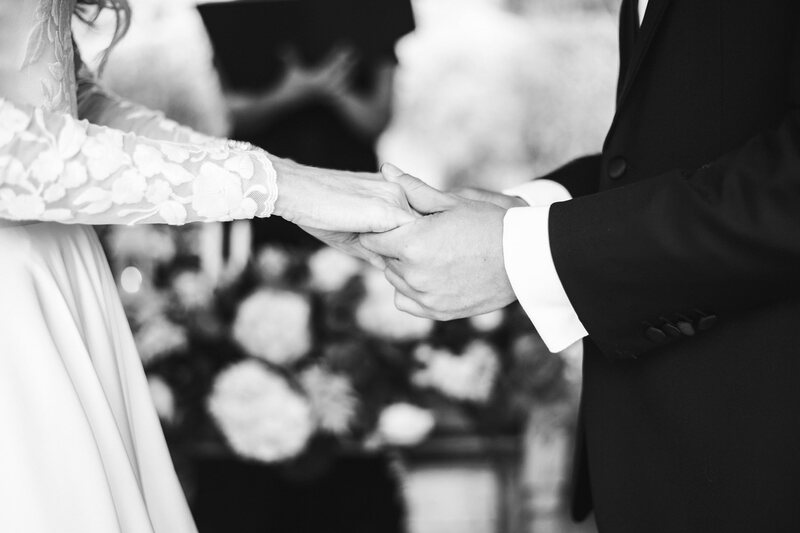 Imagine you paid attention to every single detail, in order to make everything absolutely perfect. 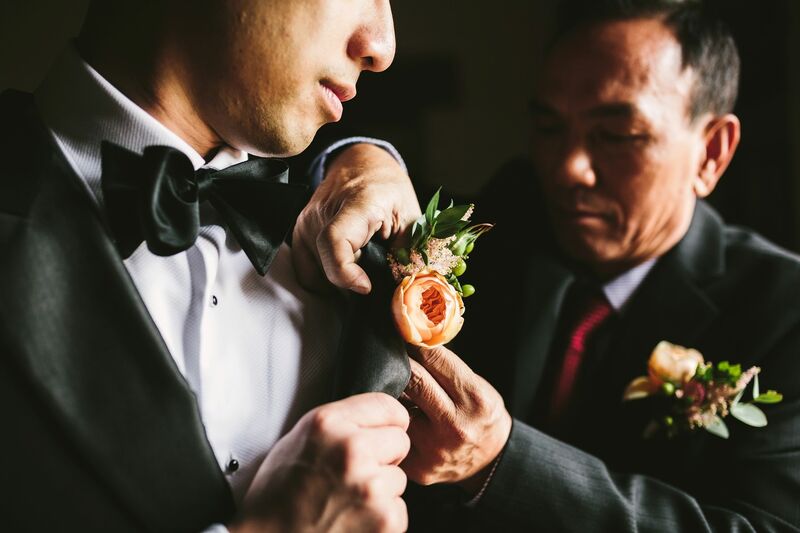 And then, imagine that all of a sudden a harmless but annoying accident happens – and ruins that perfection you created with so much care. 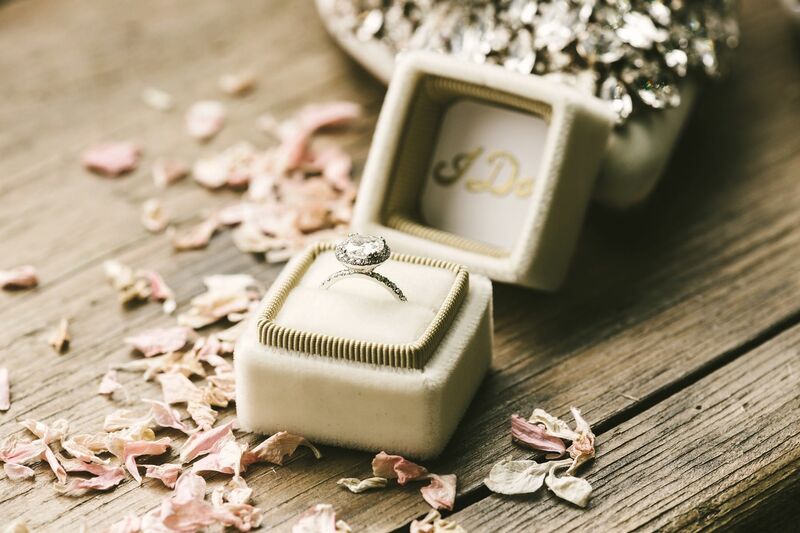 Would you be able to turn that negative occurrence into a positive one? 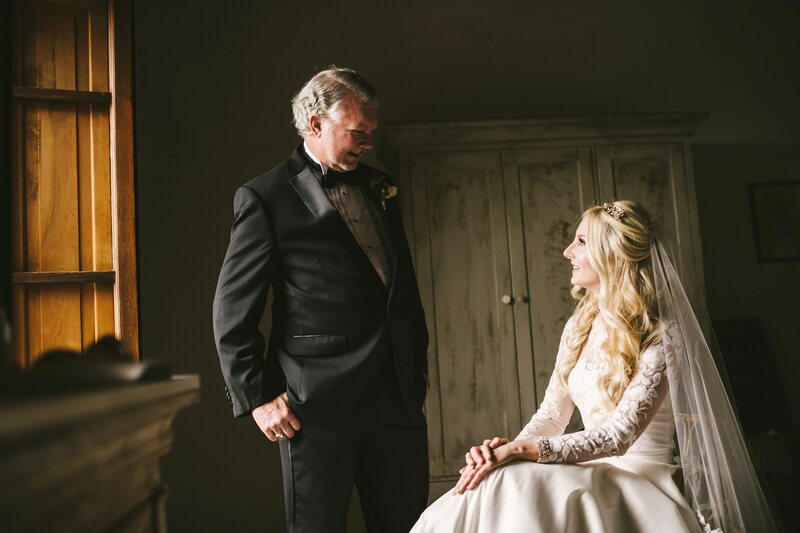 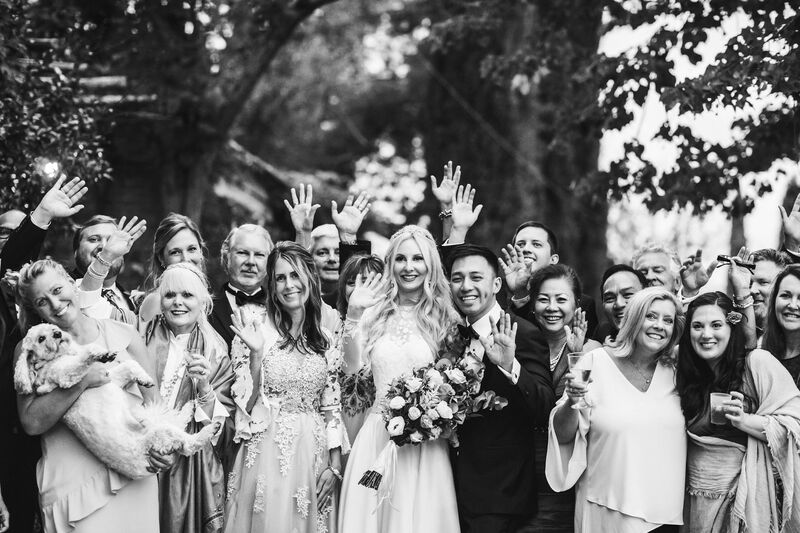 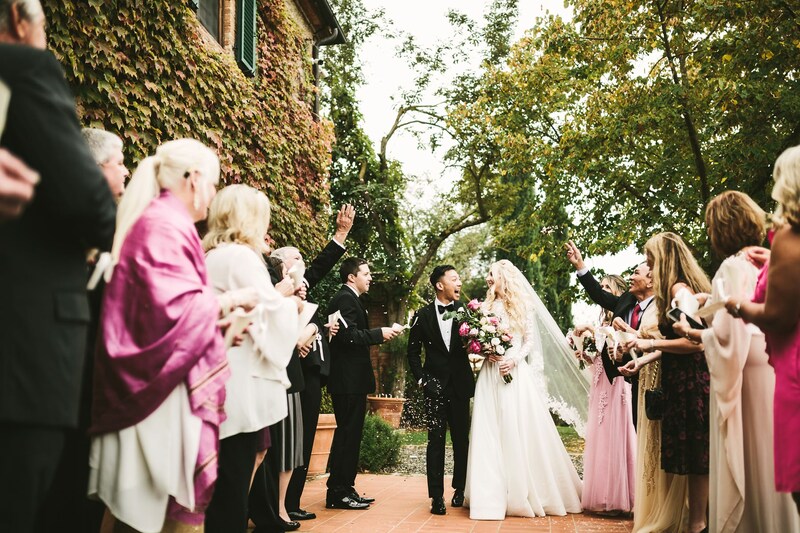 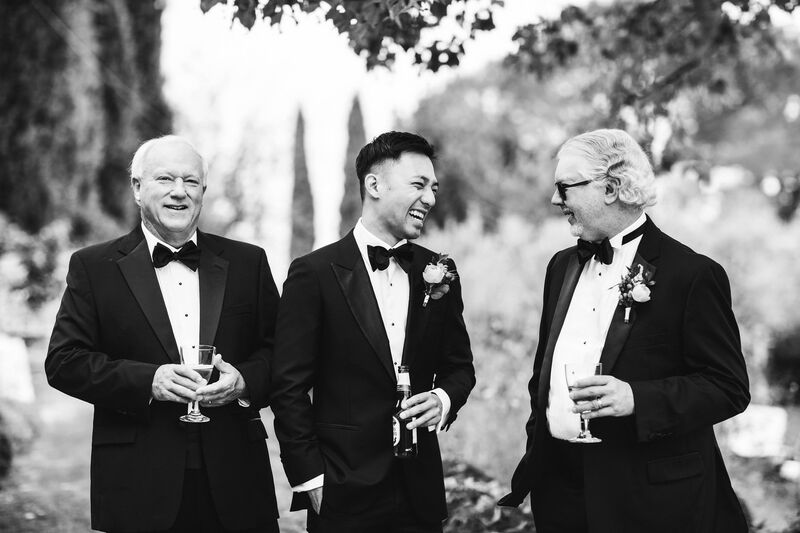 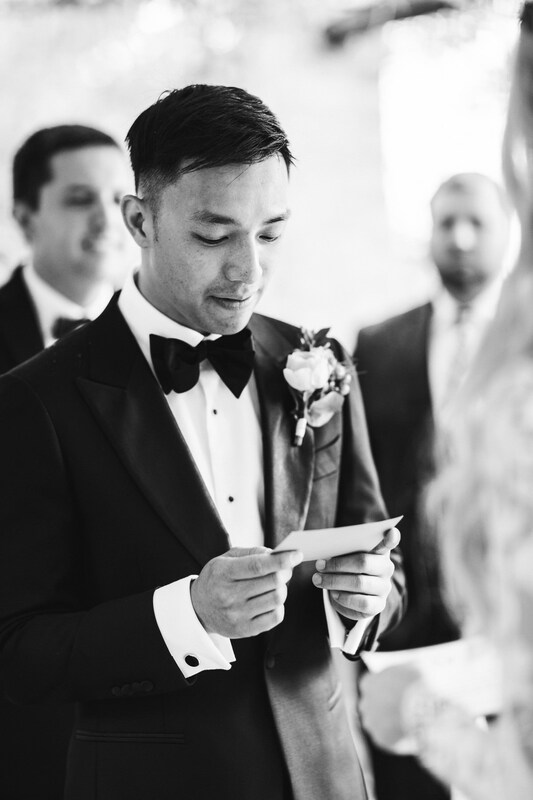 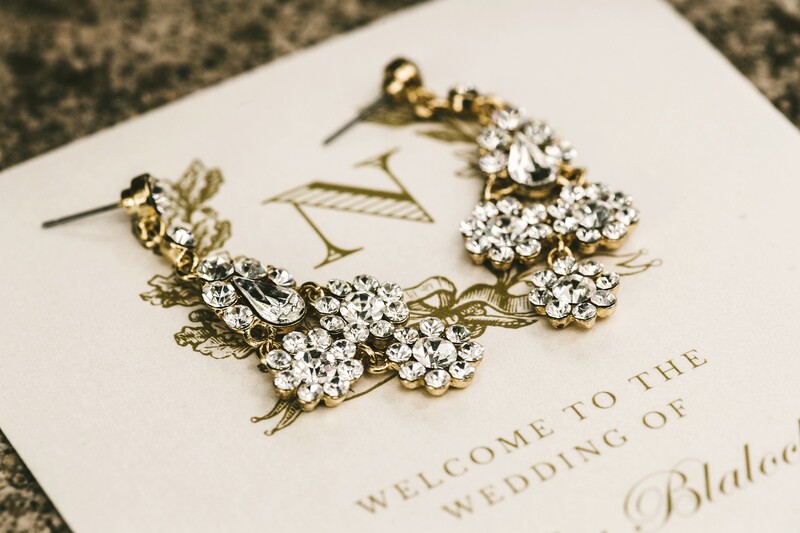 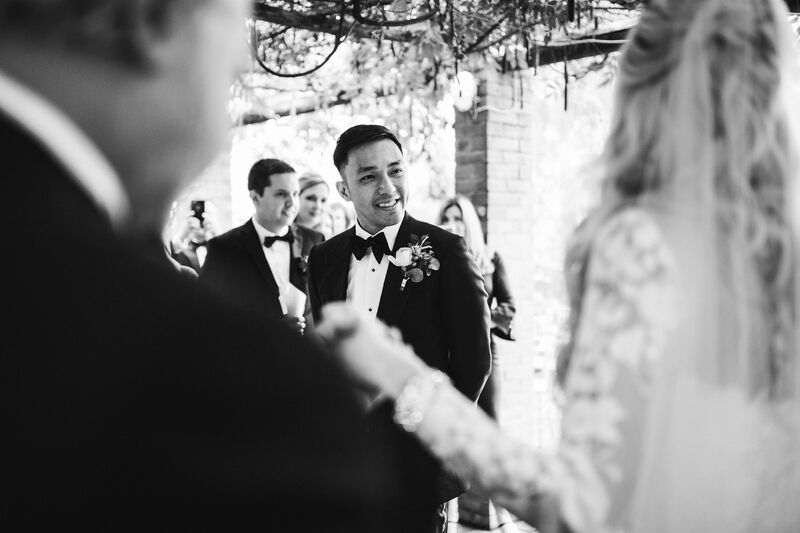 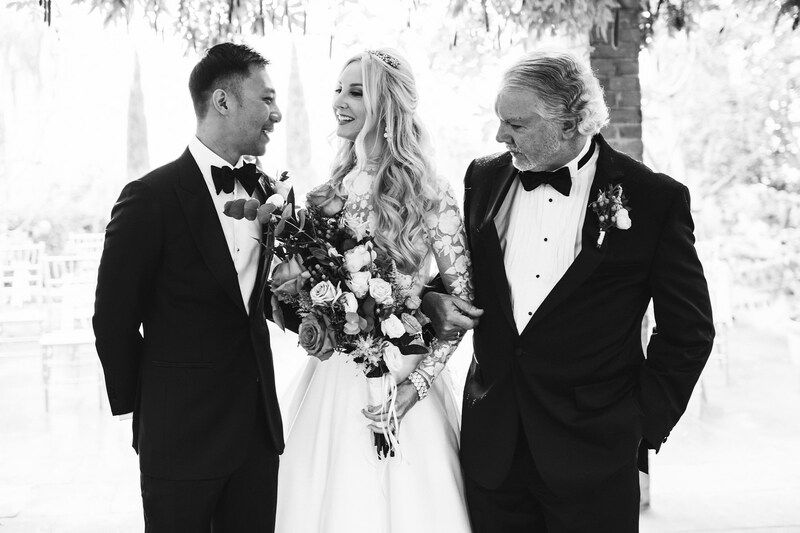 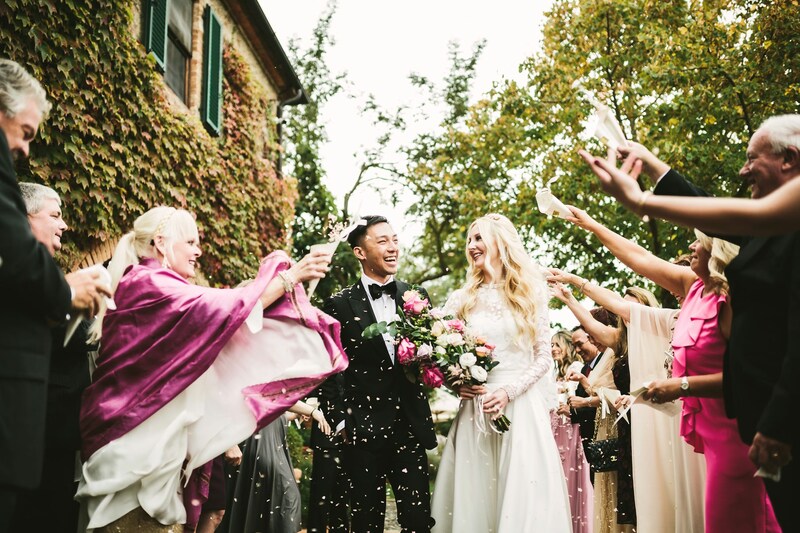 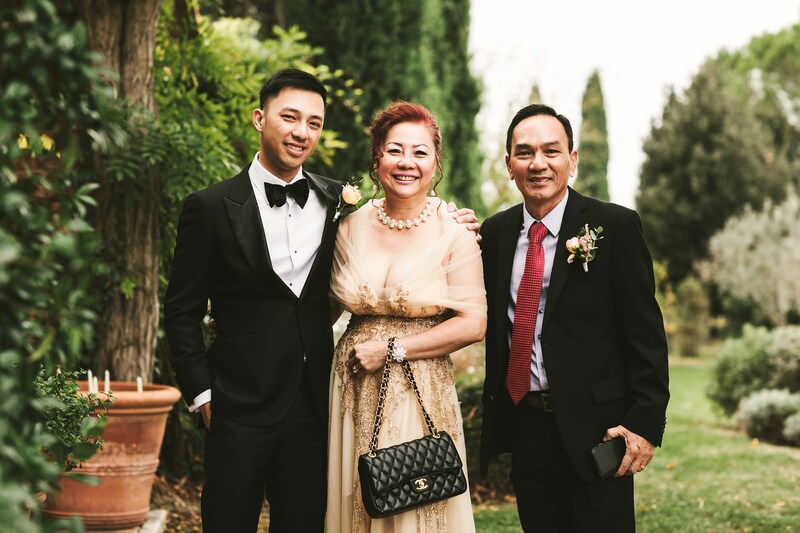 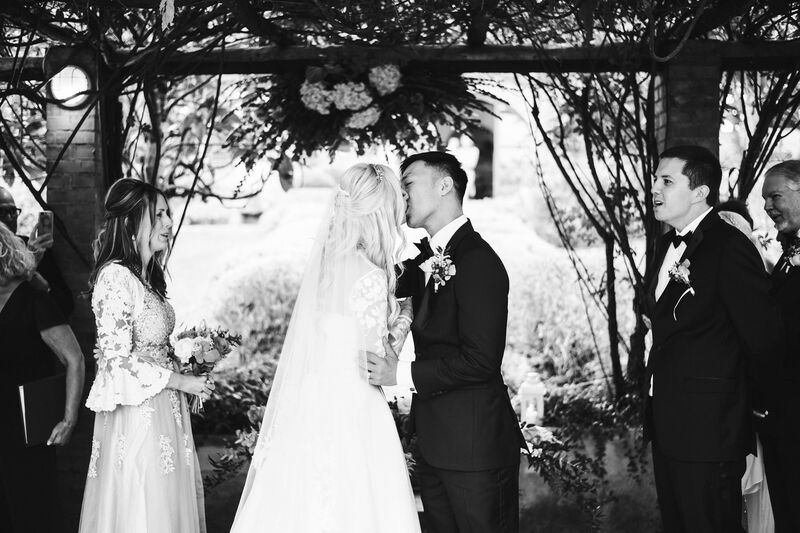 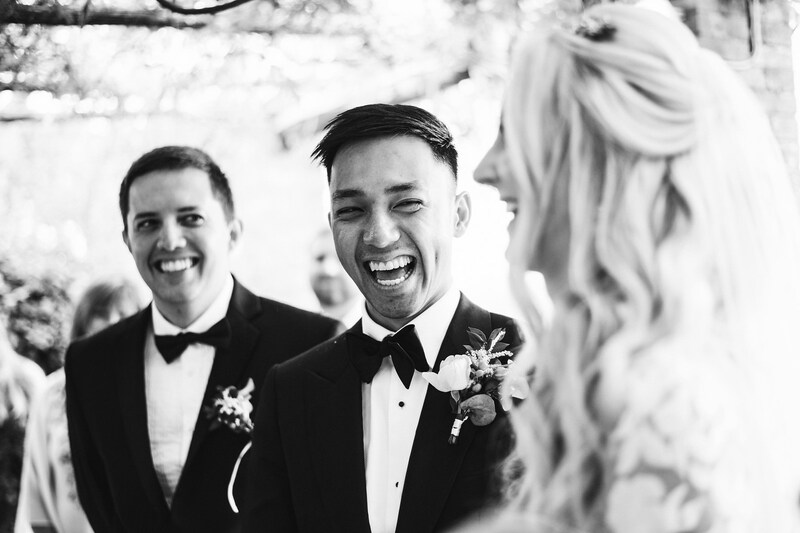 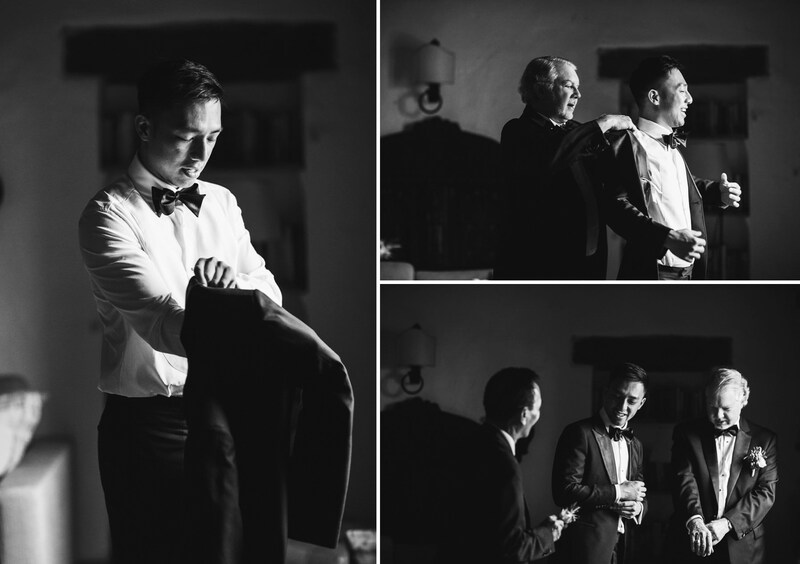 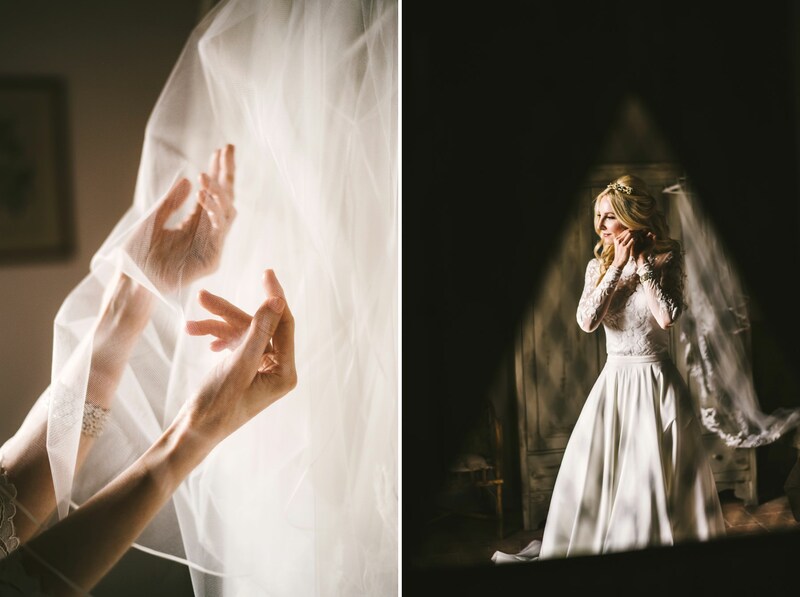 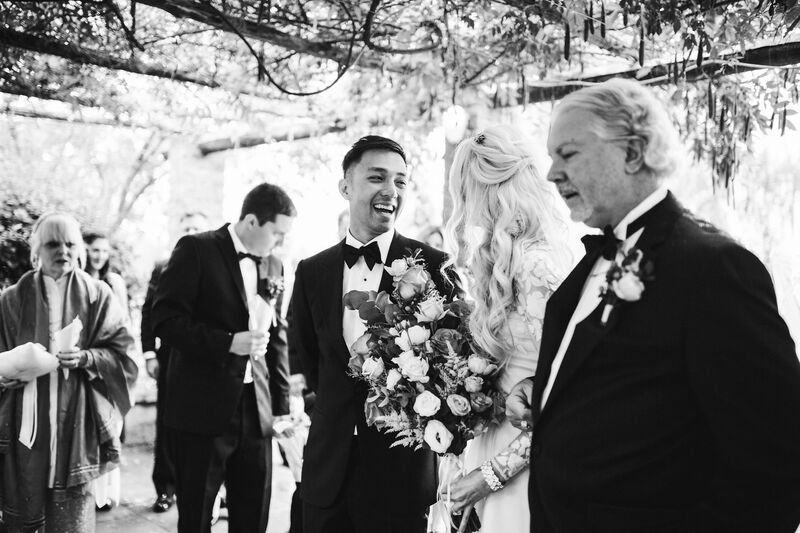 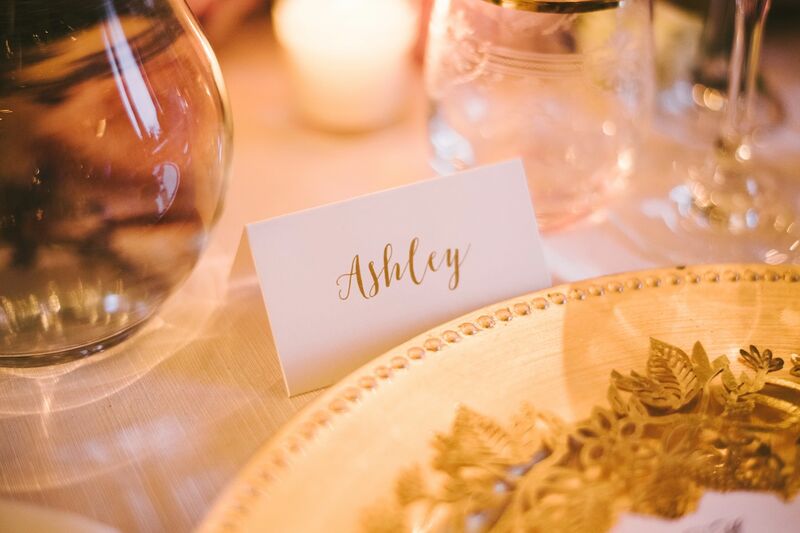 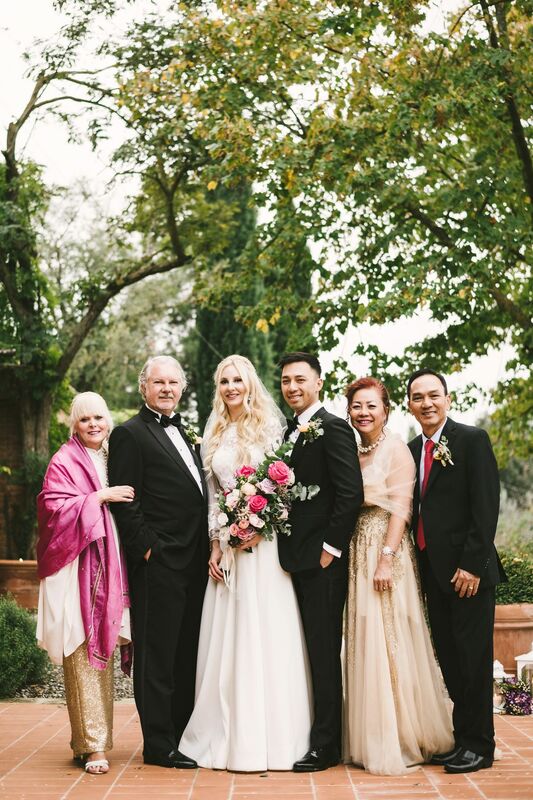 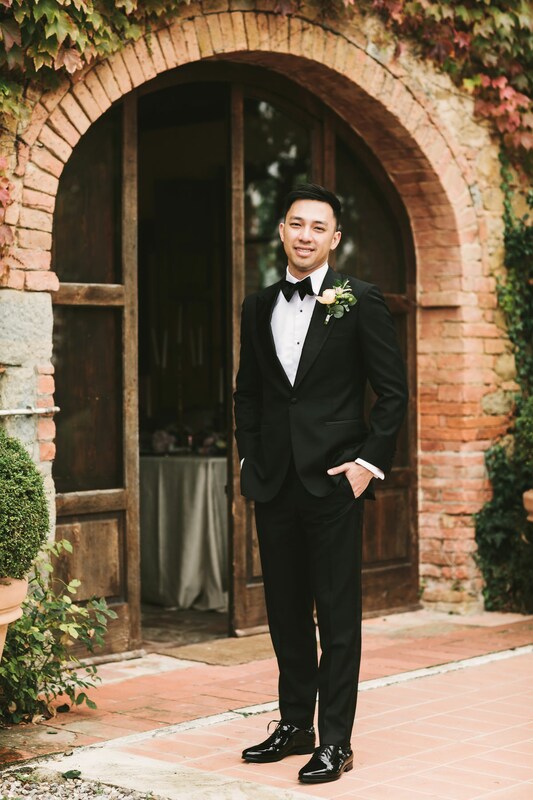 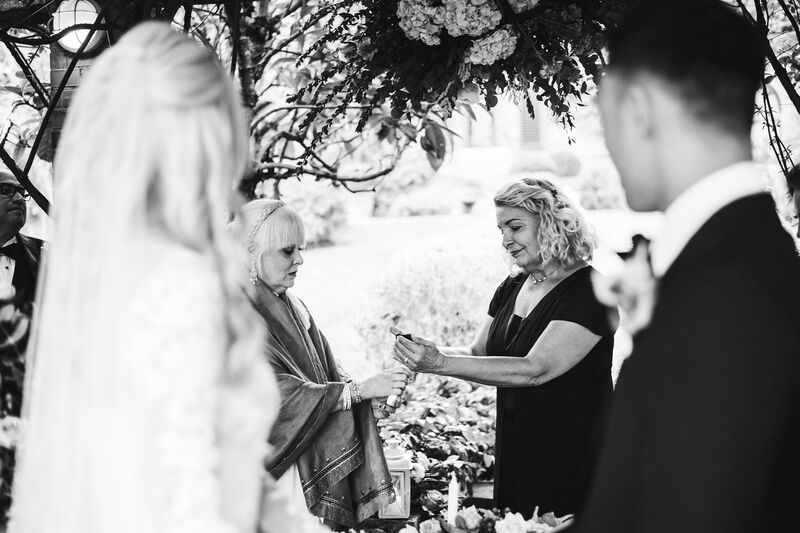 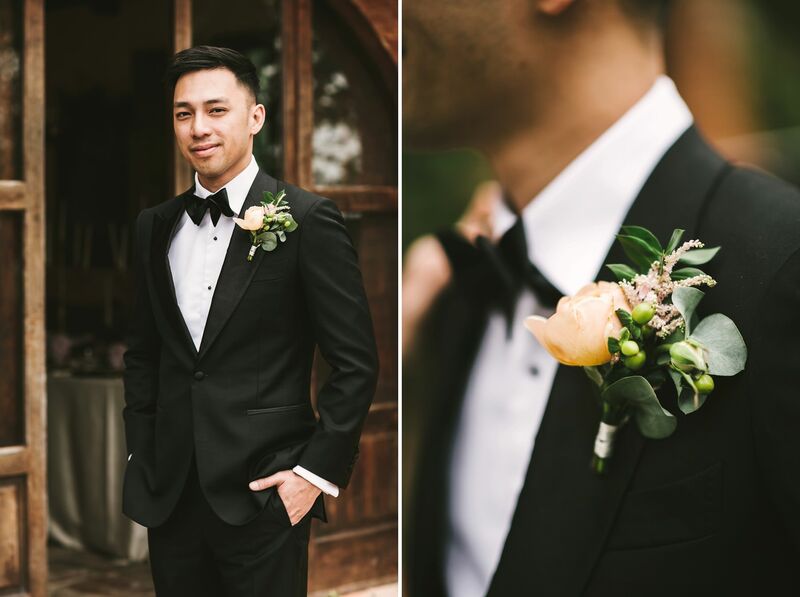 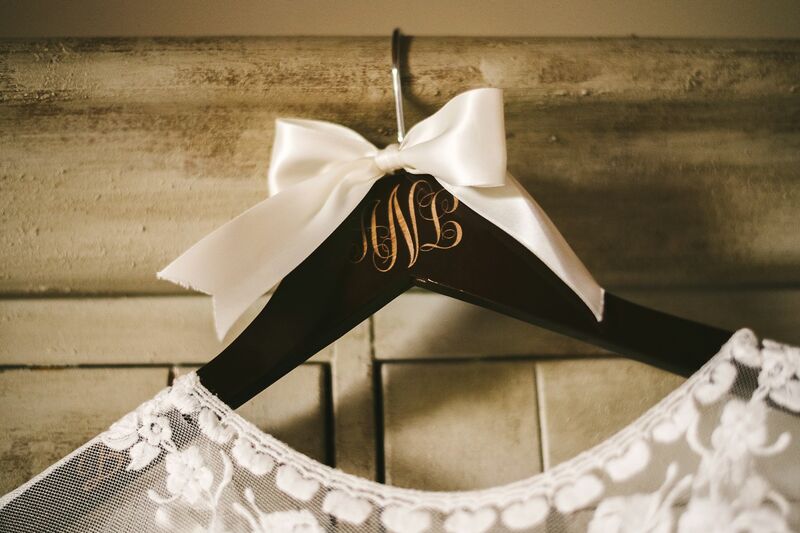 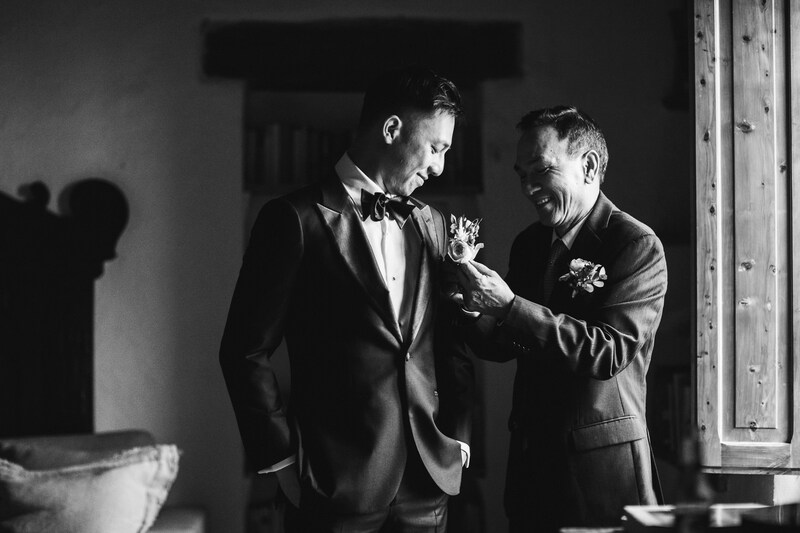 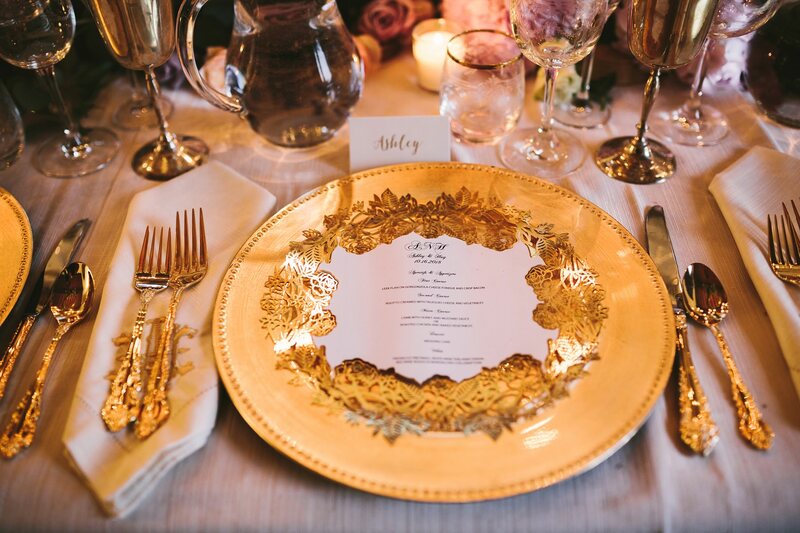 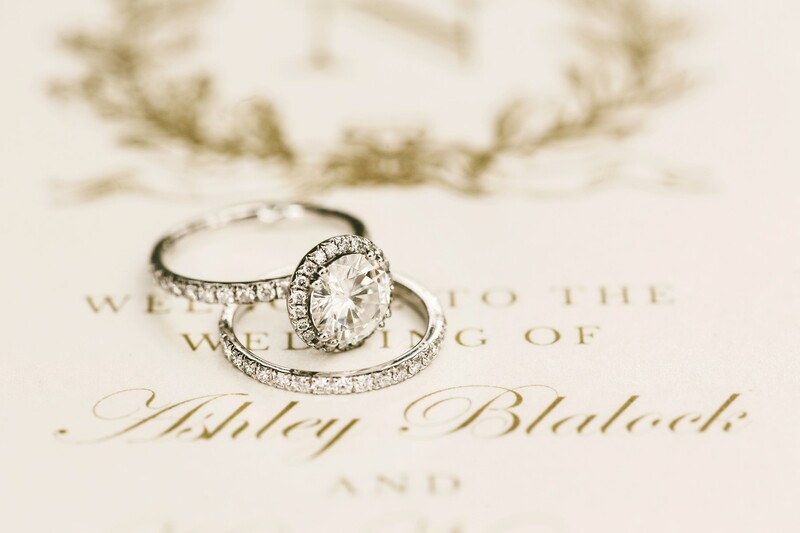 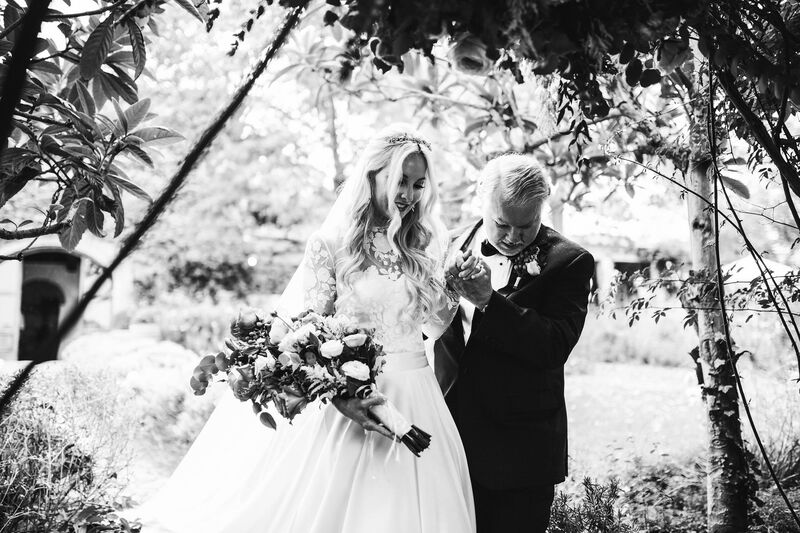 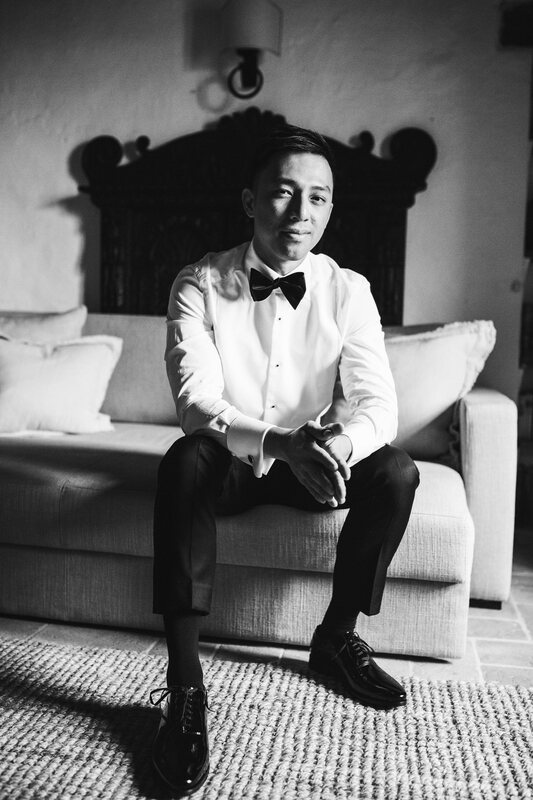 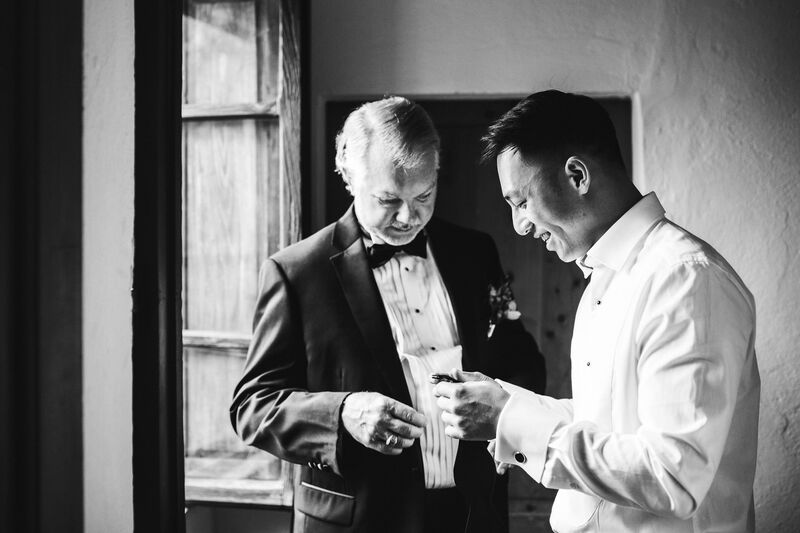 Ashley and Huy are an extremely graceful couple from Massachusetts, who planned their intimate destination wedding with the help of Beth – Ashley’s mother. 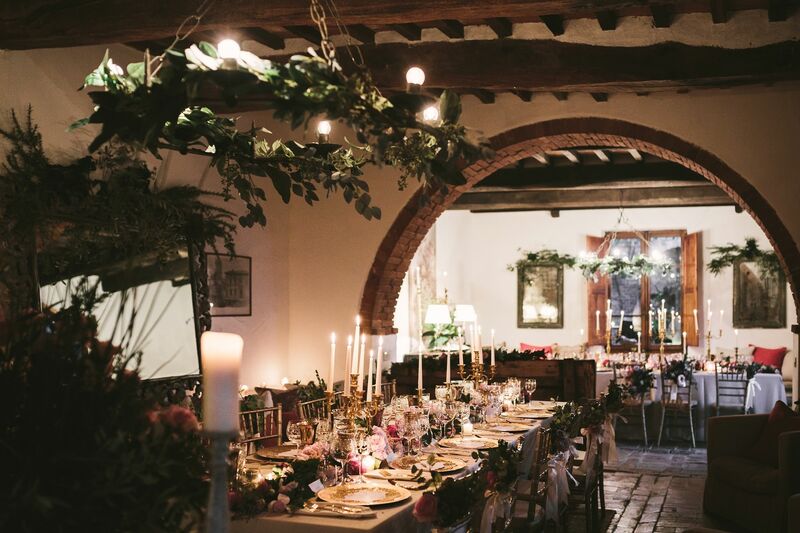 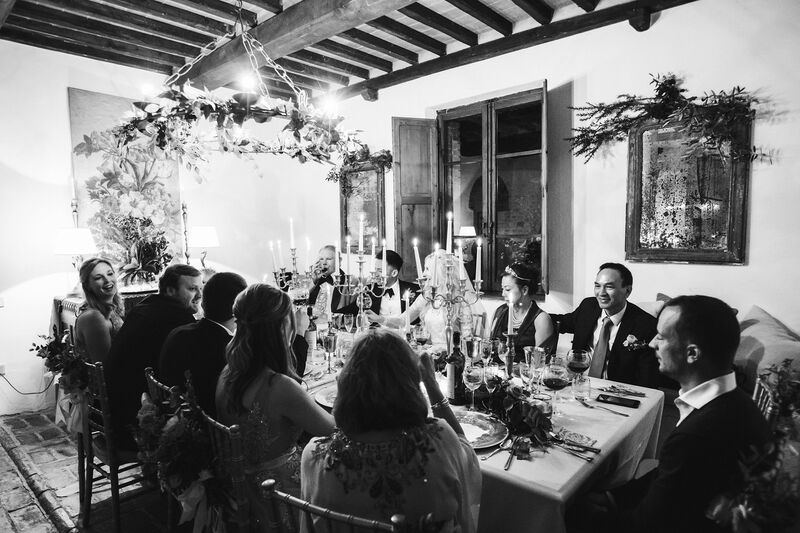 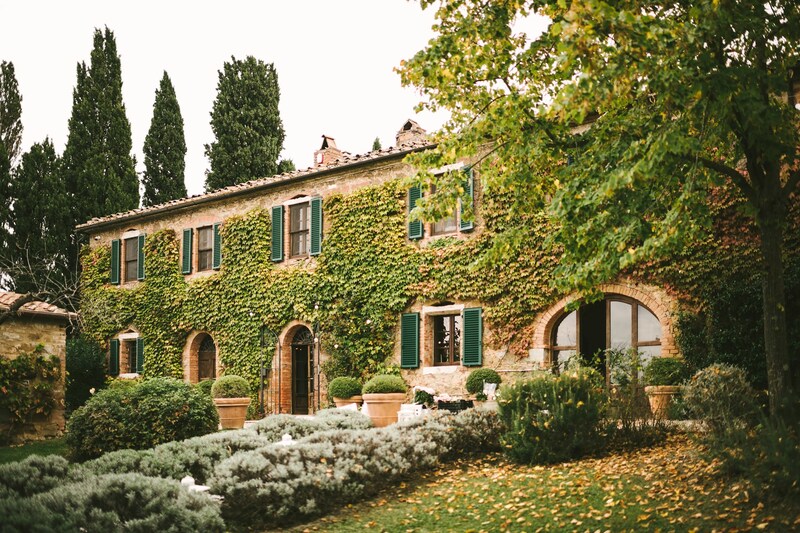 They carefully chose the location: the charming La Fornace, a lovely countryhouse nested in Val d’Orcia – possibly one of the best hilly areas of all Tuscany. 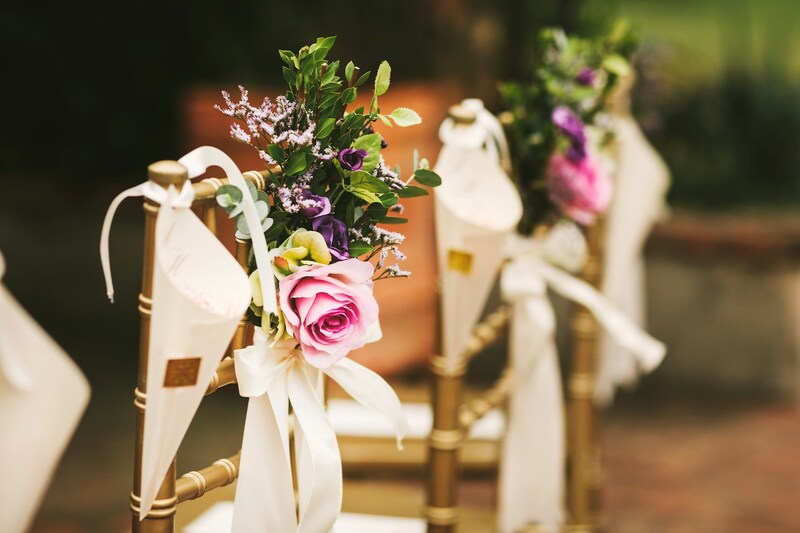 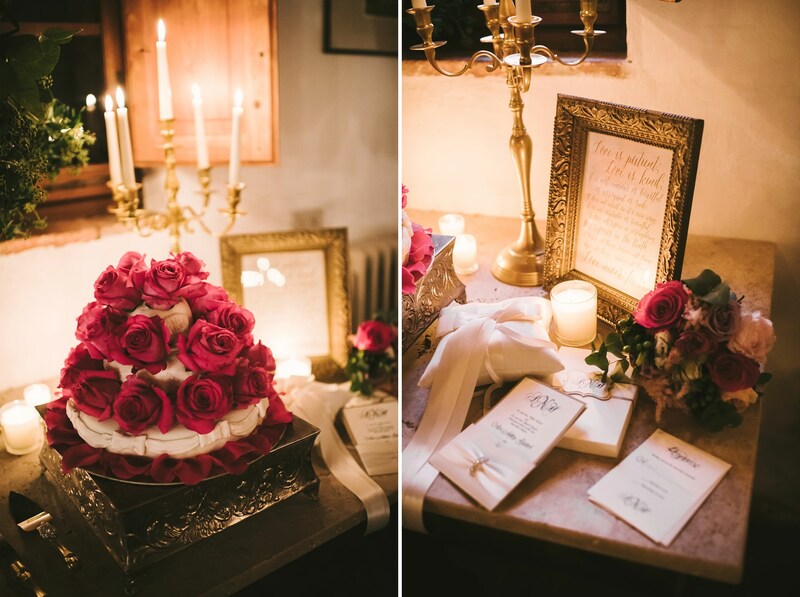 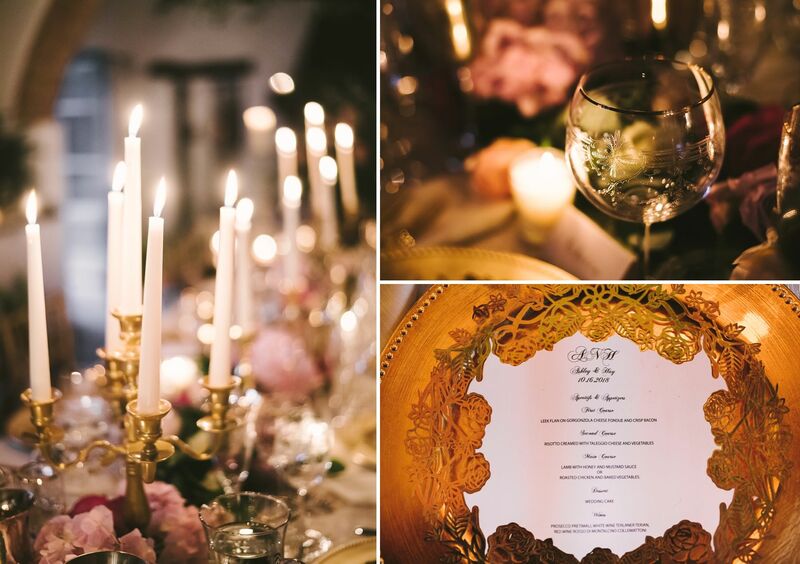 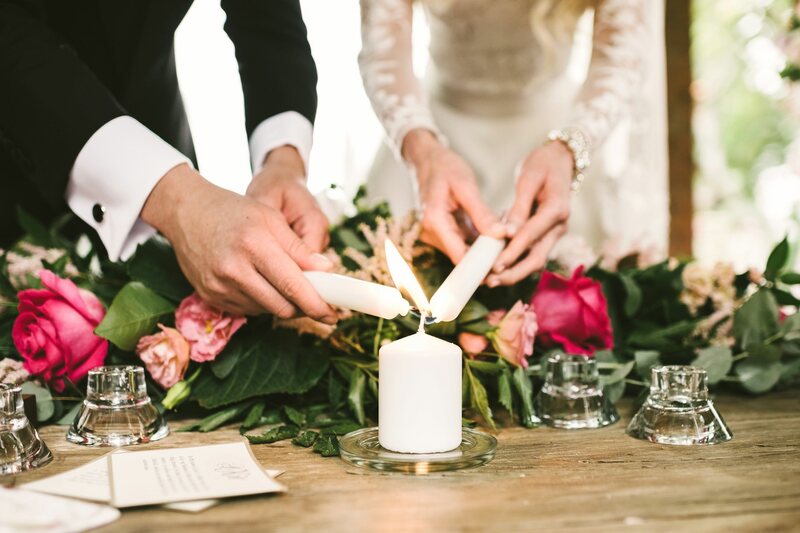 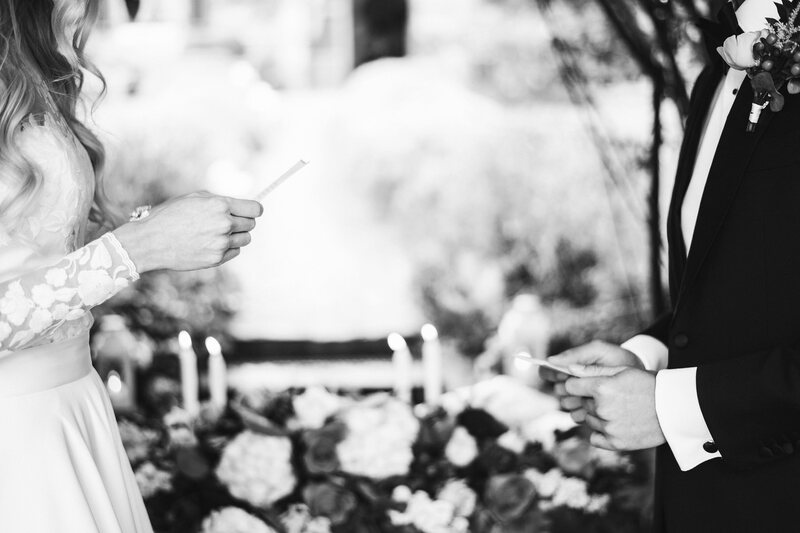 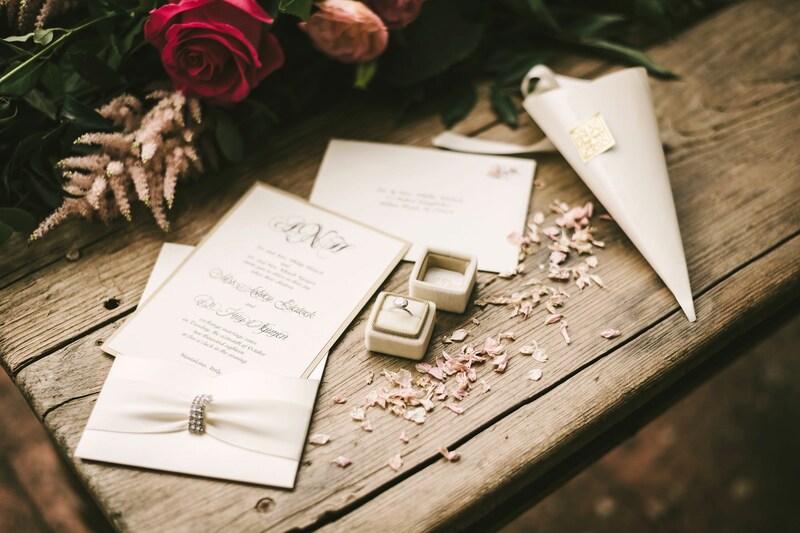 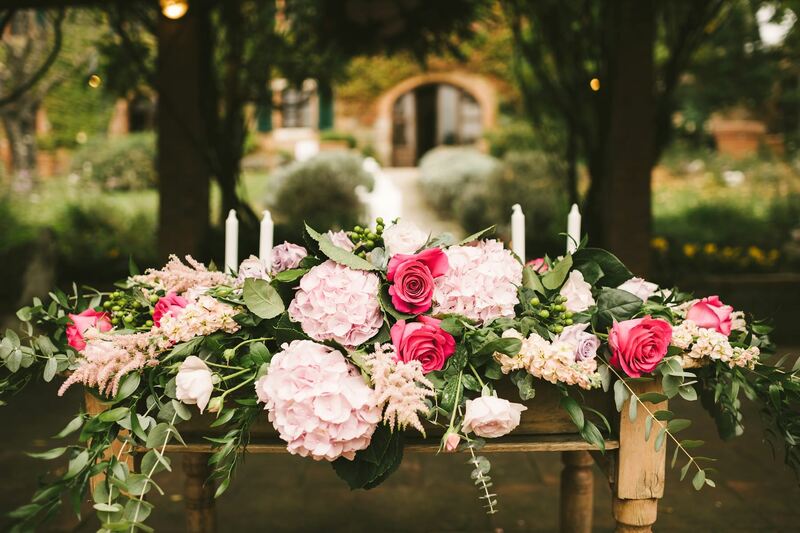 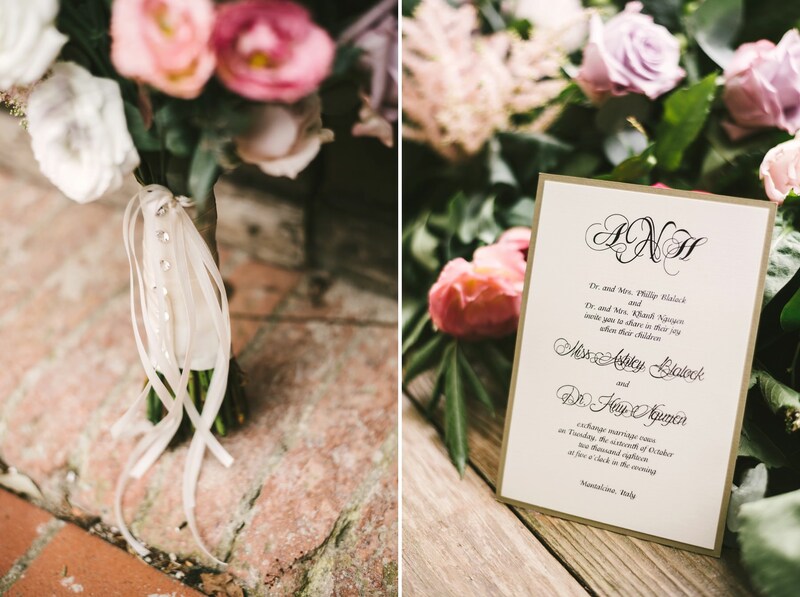 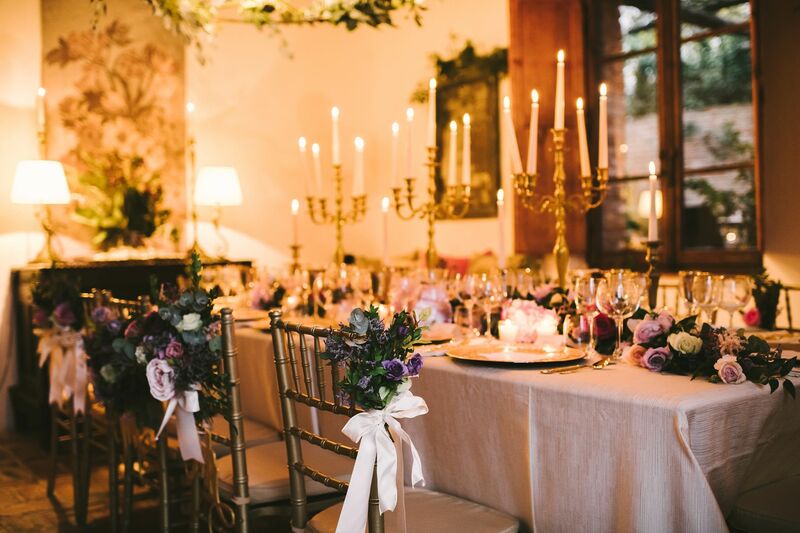 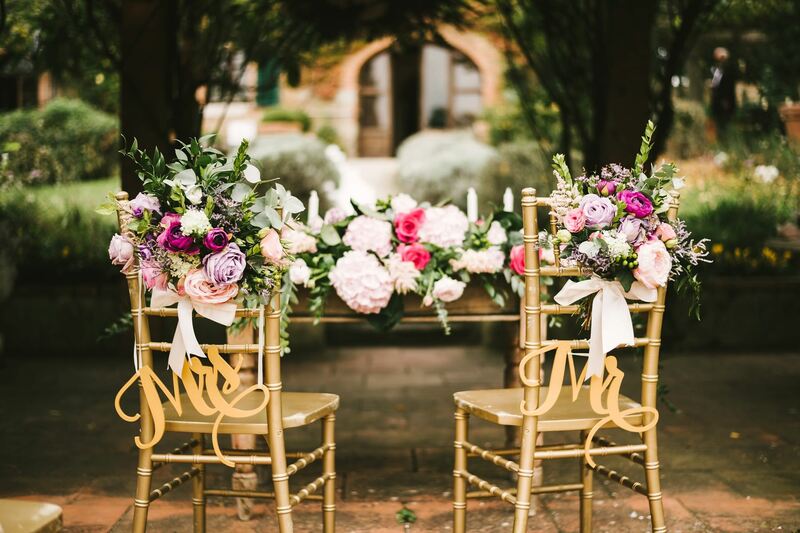 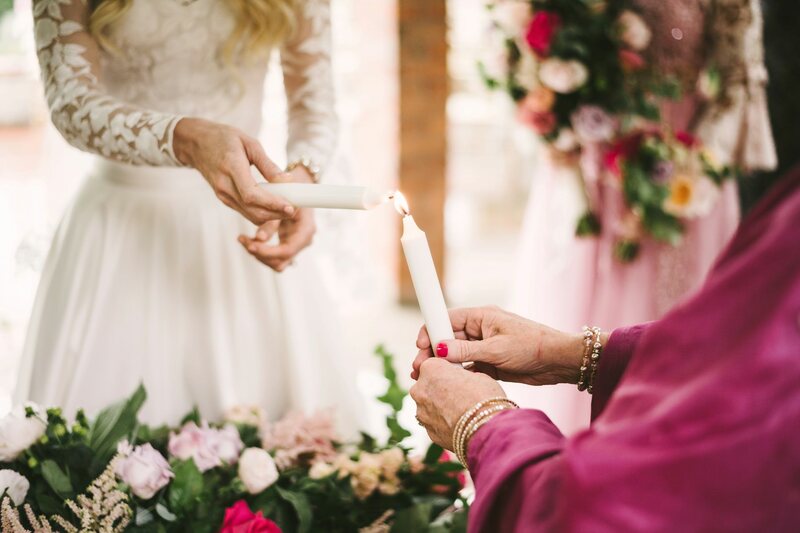 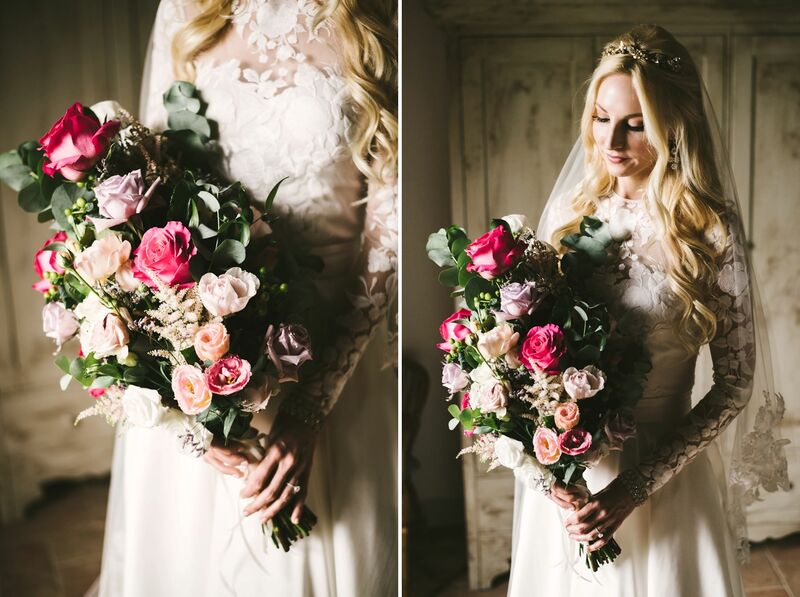 They picked the decorations: delicate flowers, dreamy candles and chic dashes. 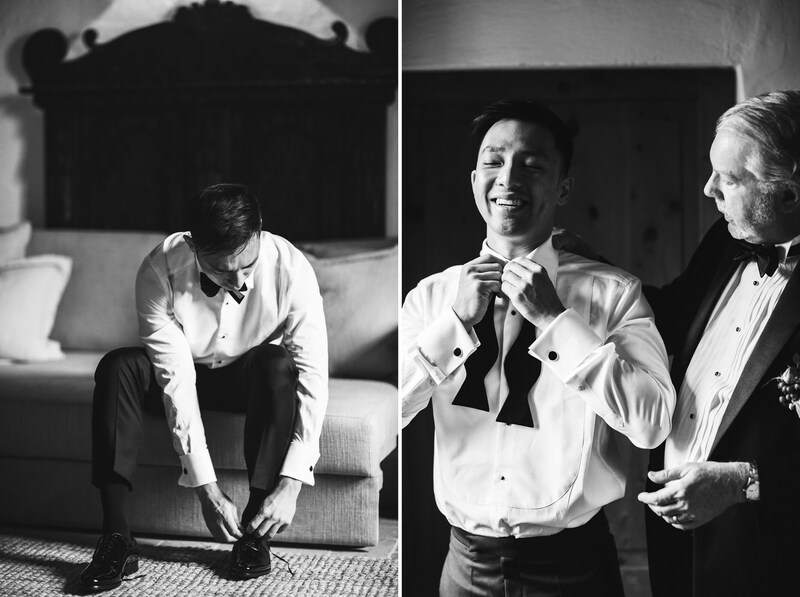 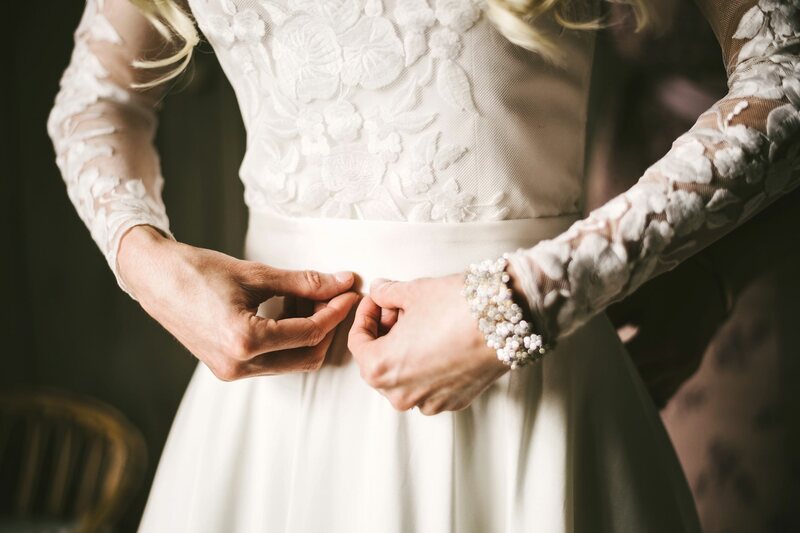 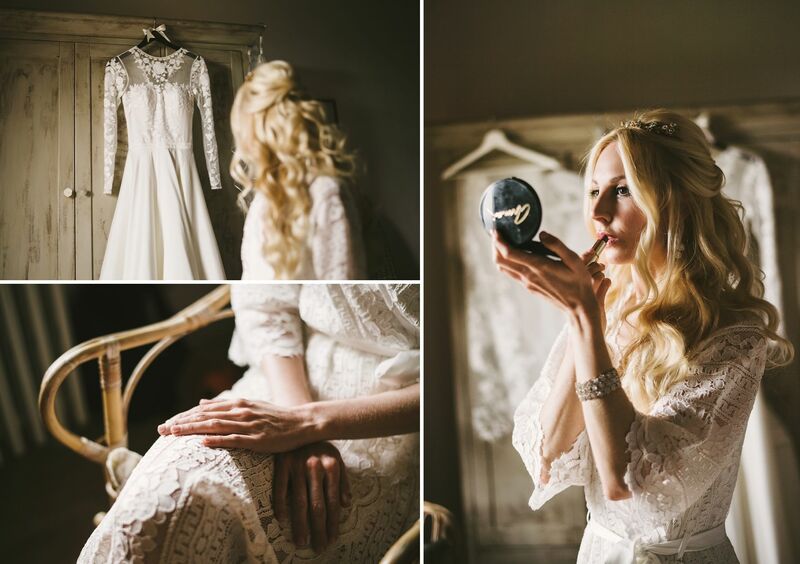 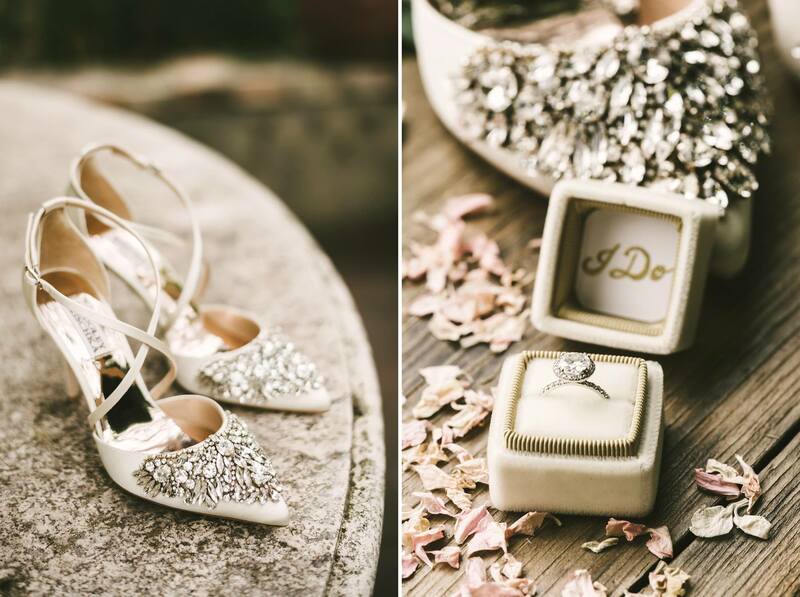 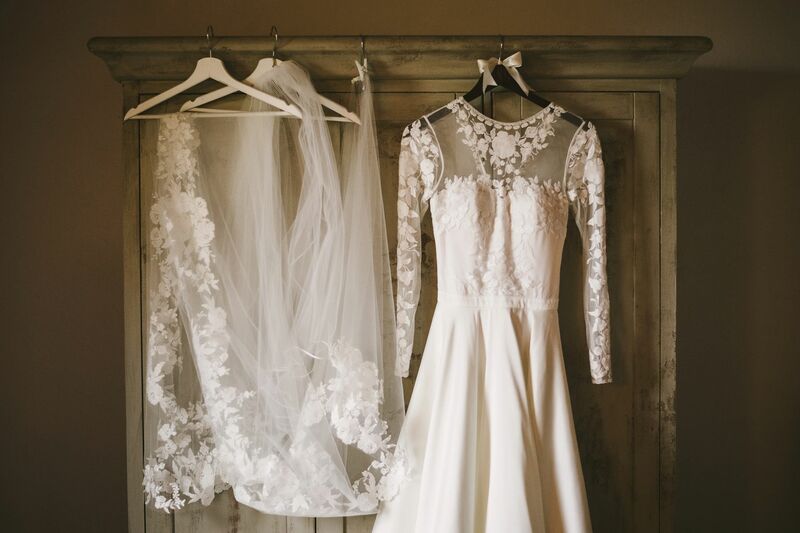 They selected the best gown and suit, and paired them to the most refined accessories. 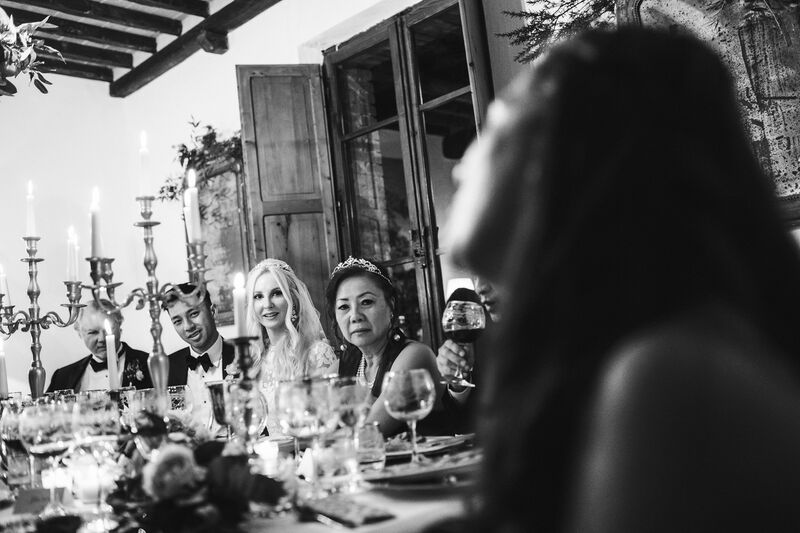 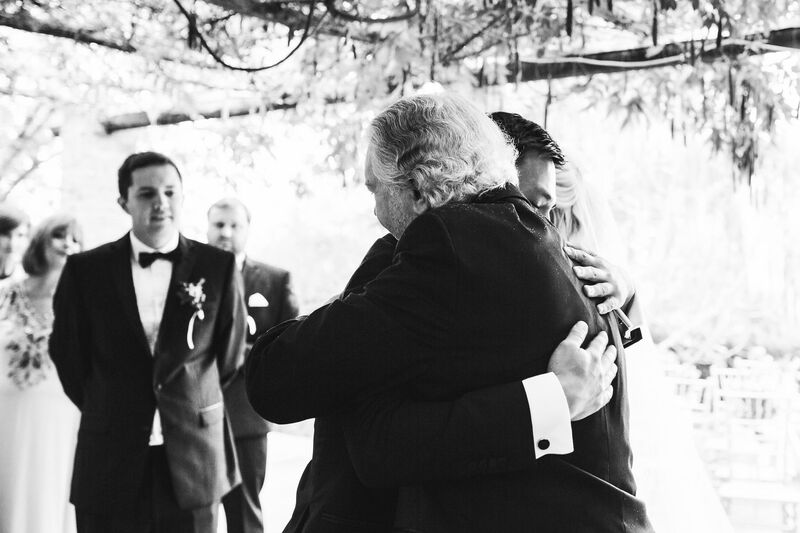 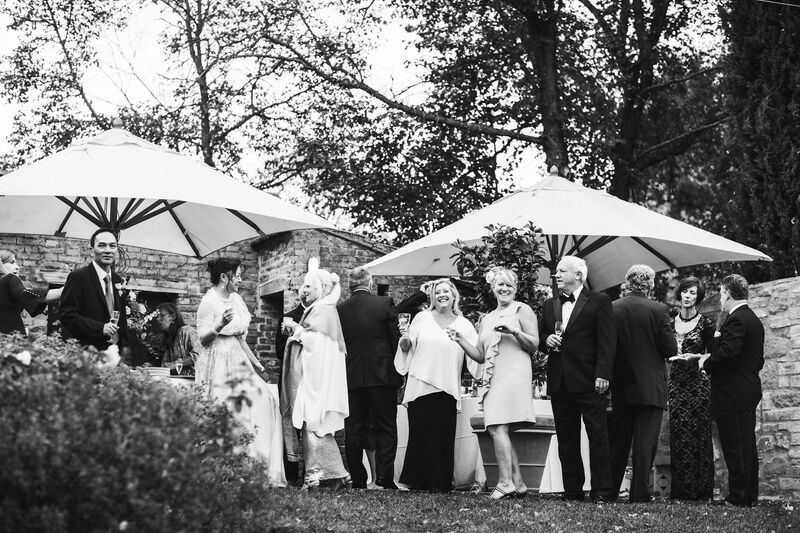 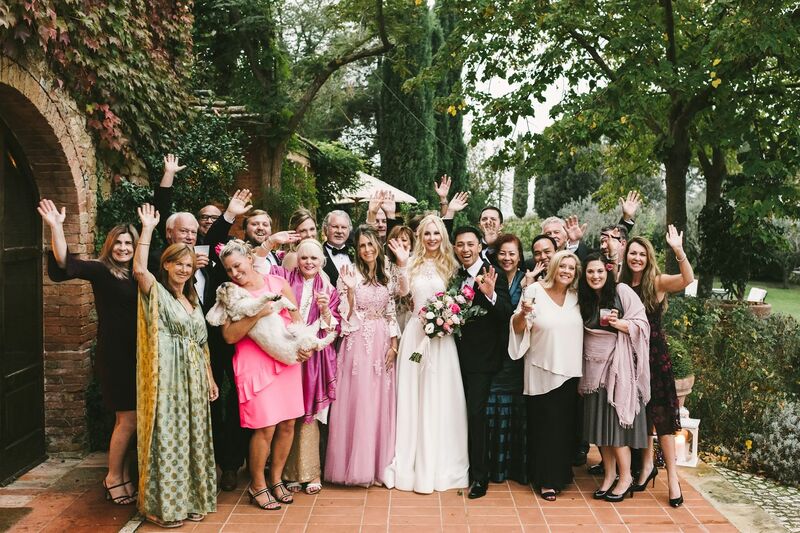 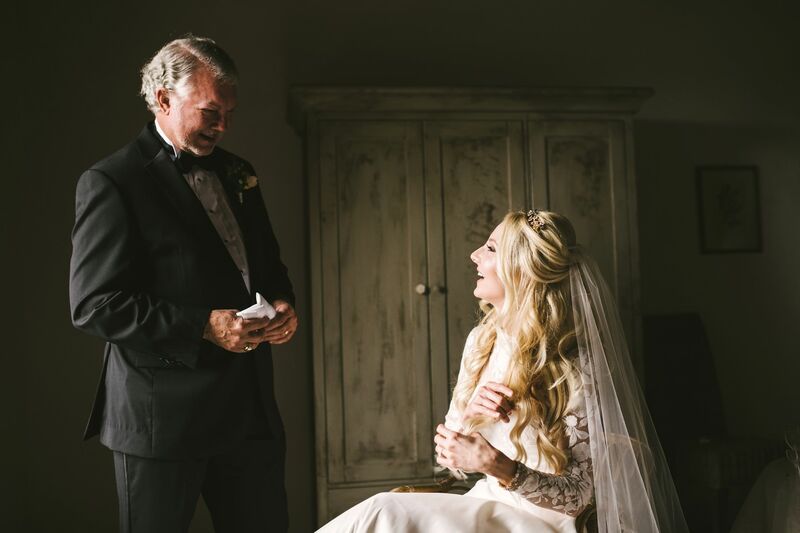 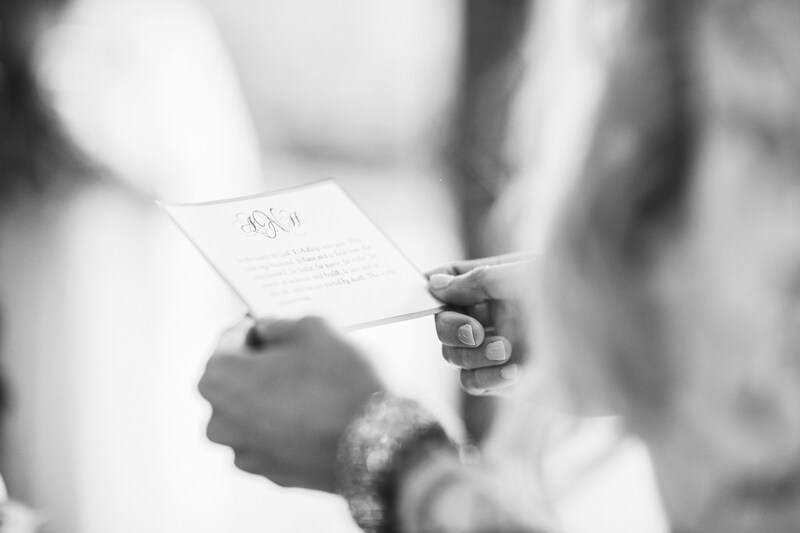 They invited just a few friends and family members, in order to have a really intimate destination wedding with the most important people of their lives. 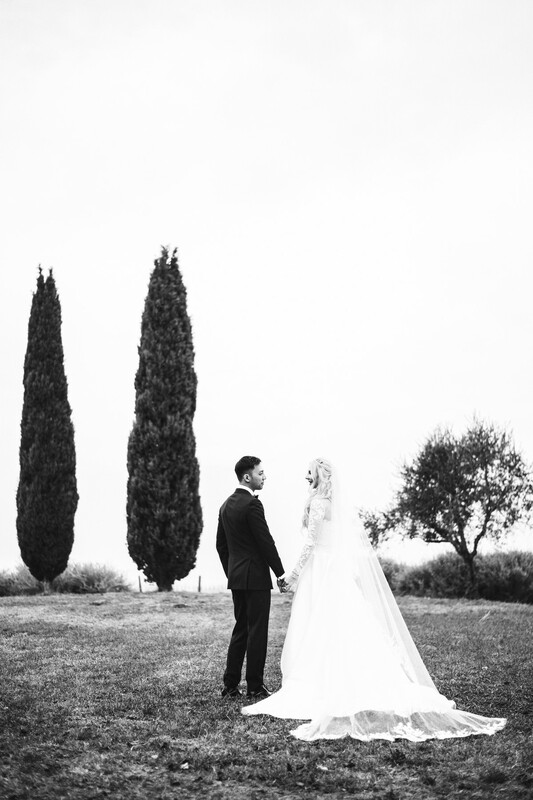 Everything was ready for their elegant wedding, everything was perfect… but then, rain came into the picture! 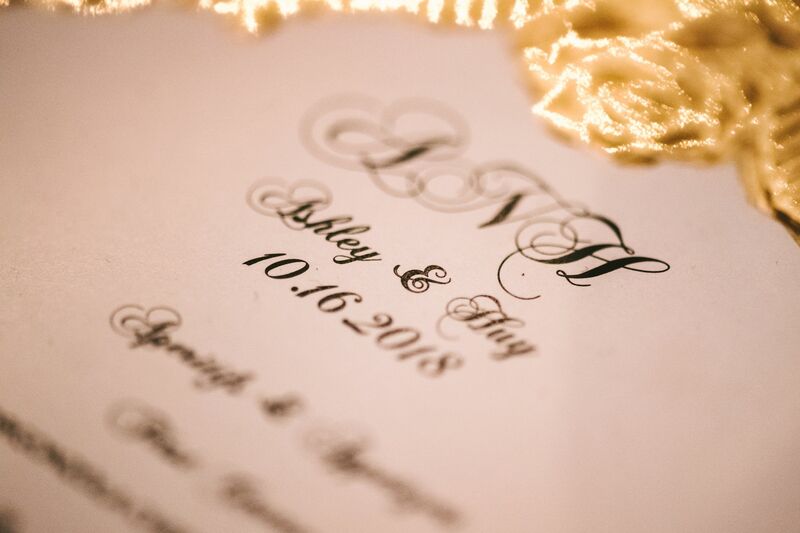 Of course the set up for the ceremony was affected, but luckily we had already taken photos of it! 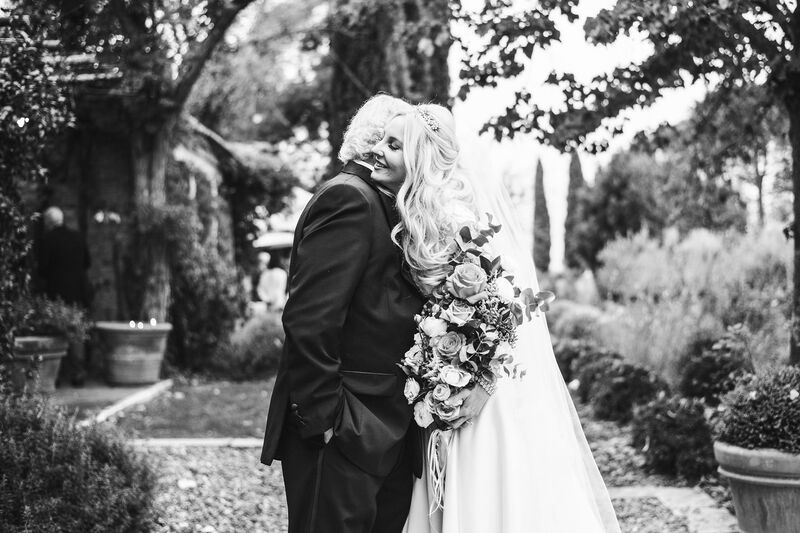 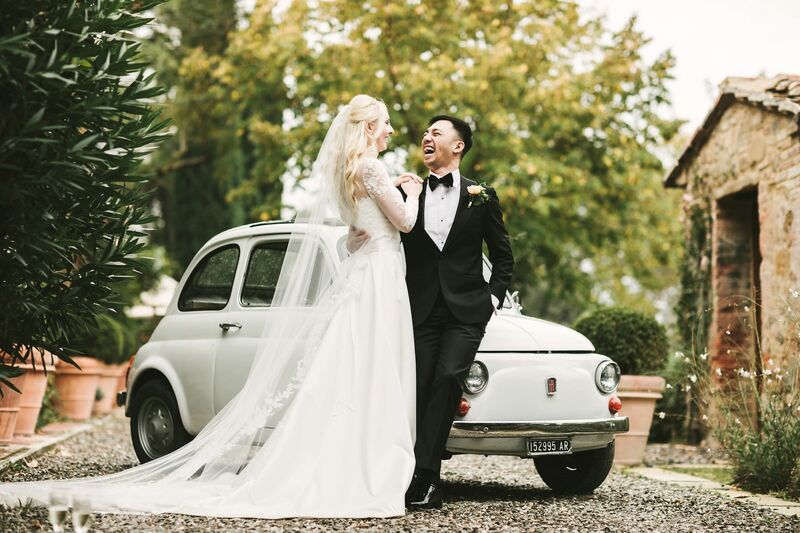 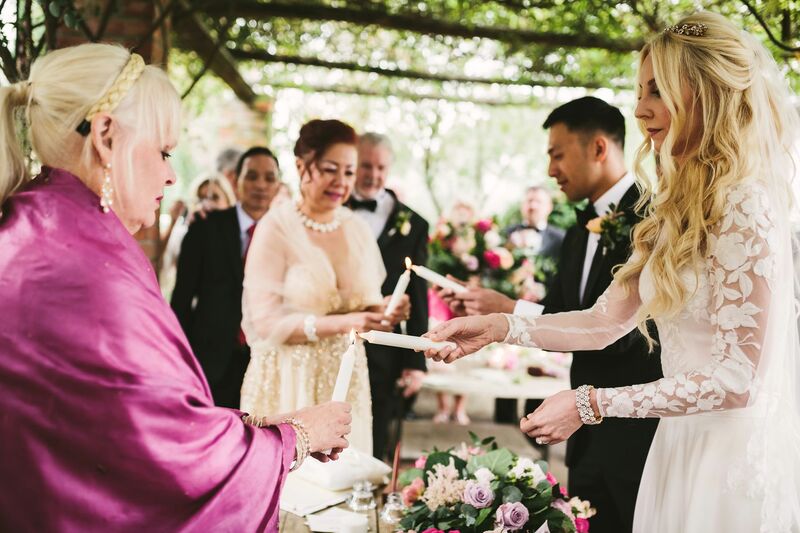 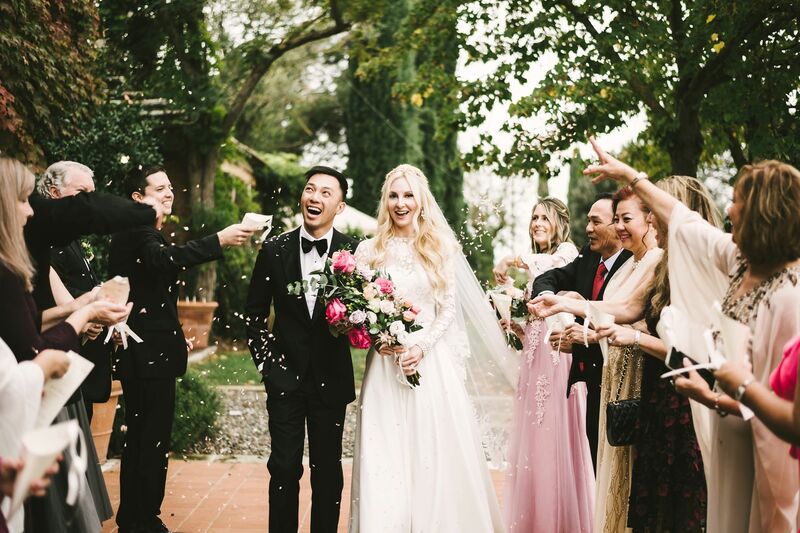 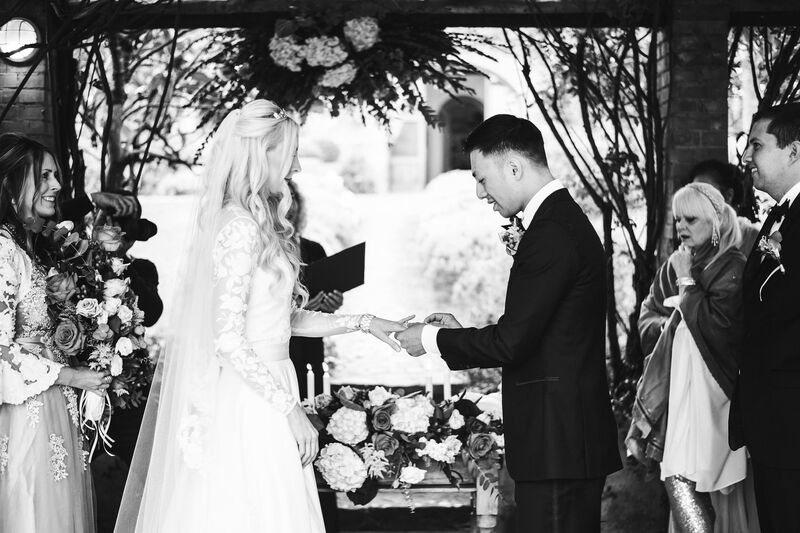 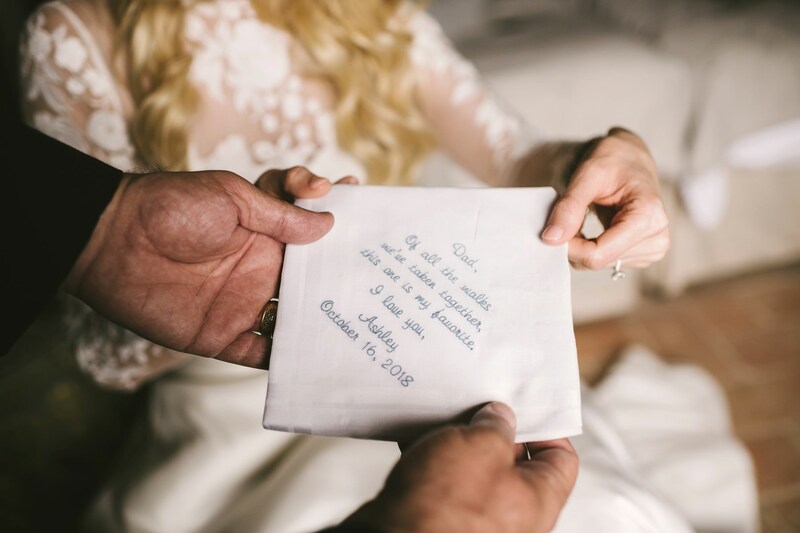 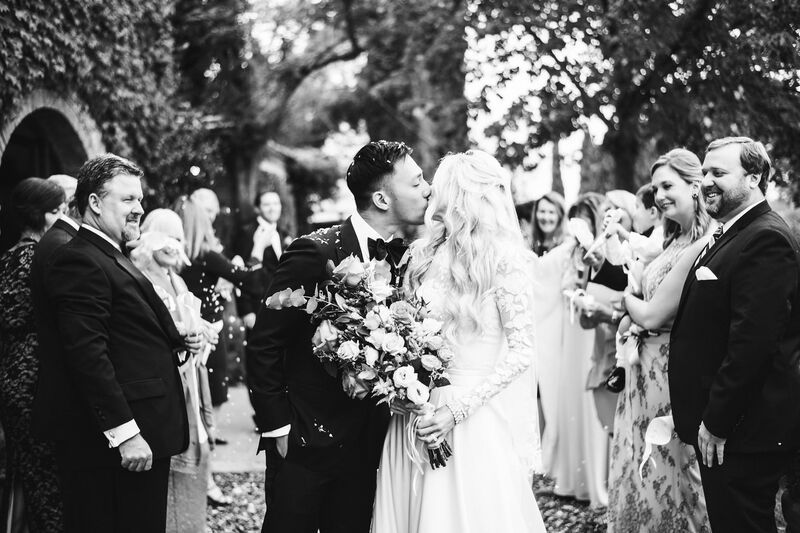 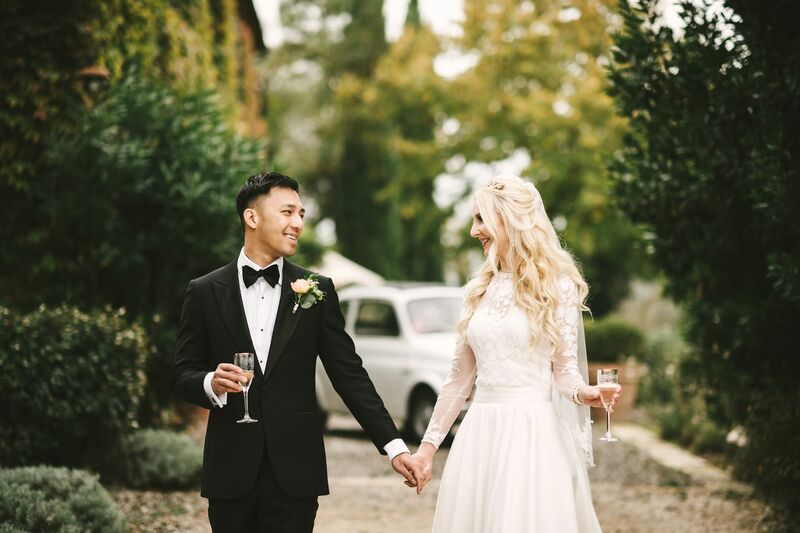 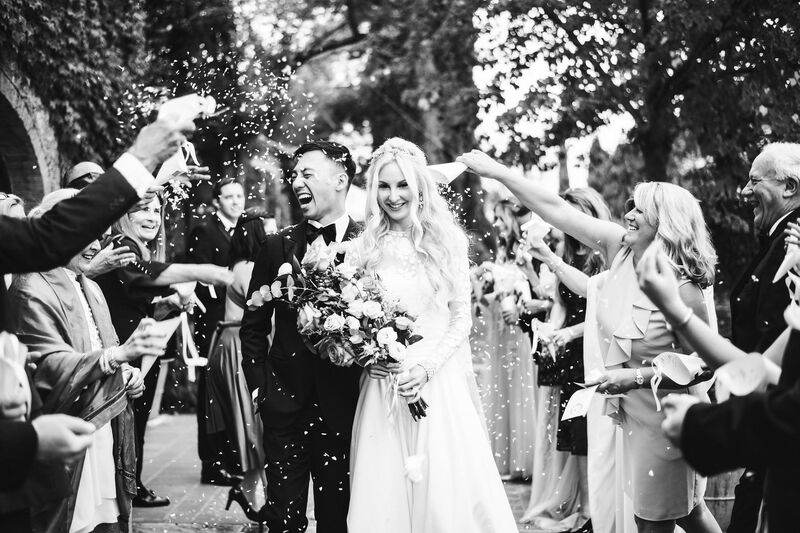 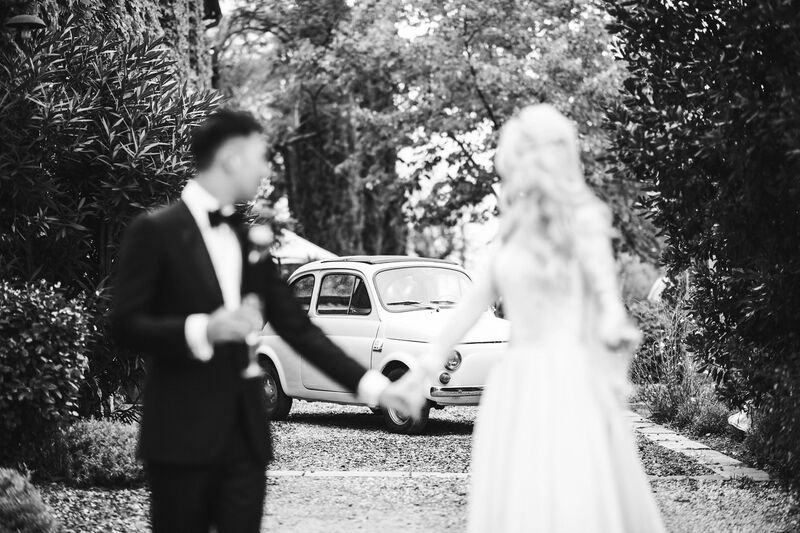 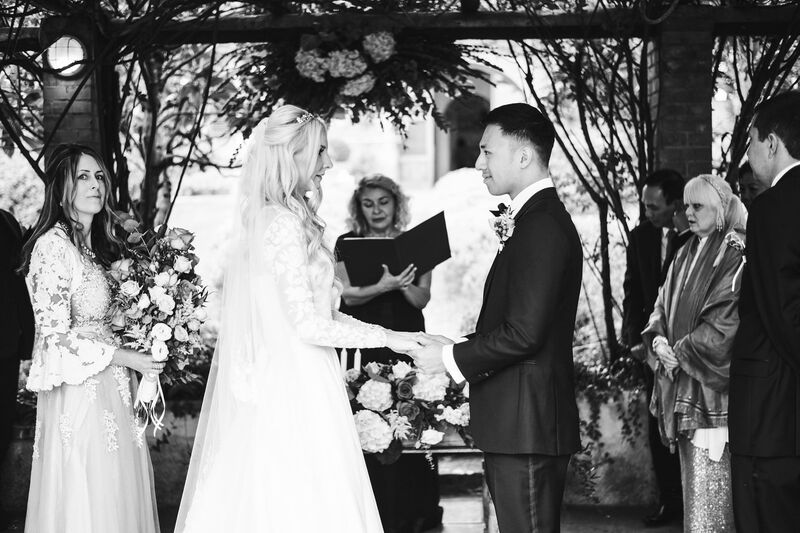 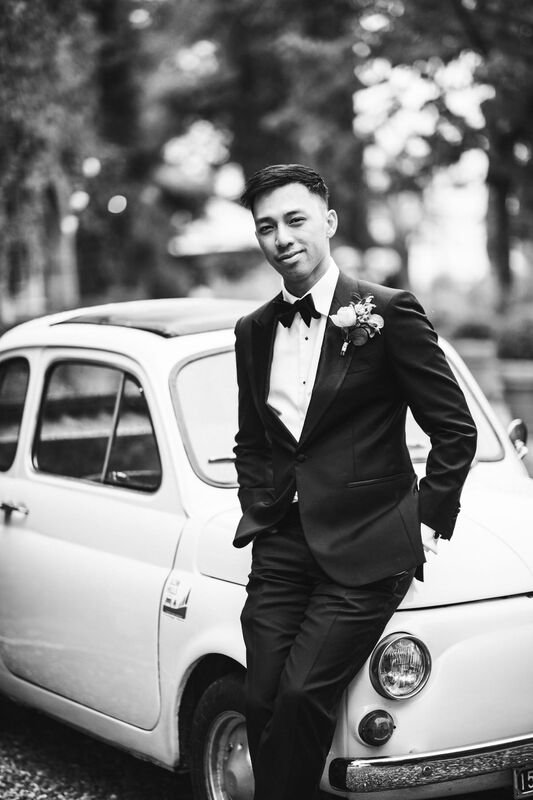 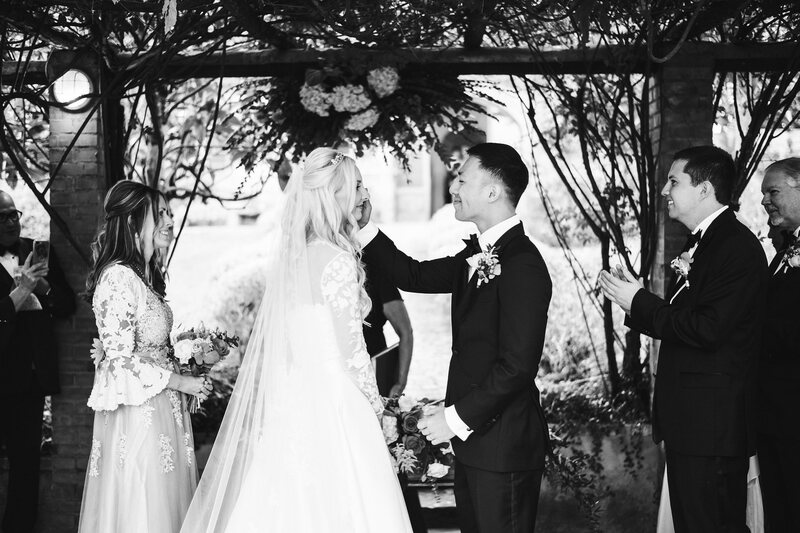 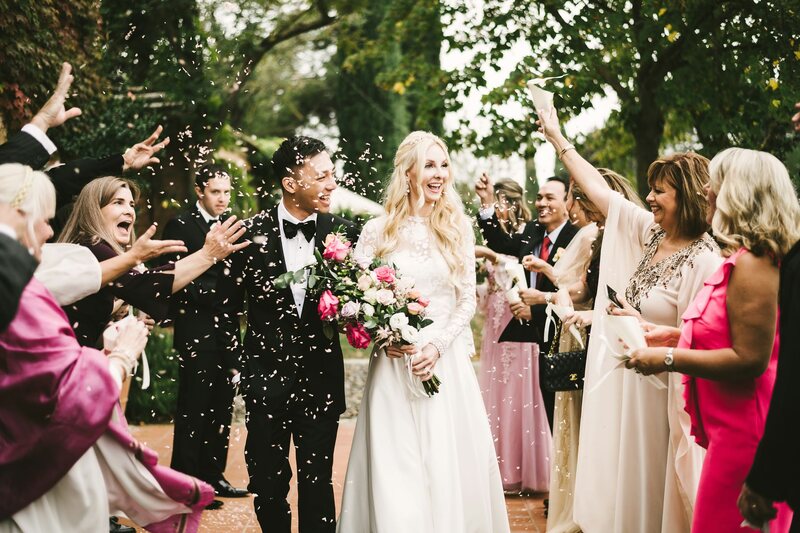 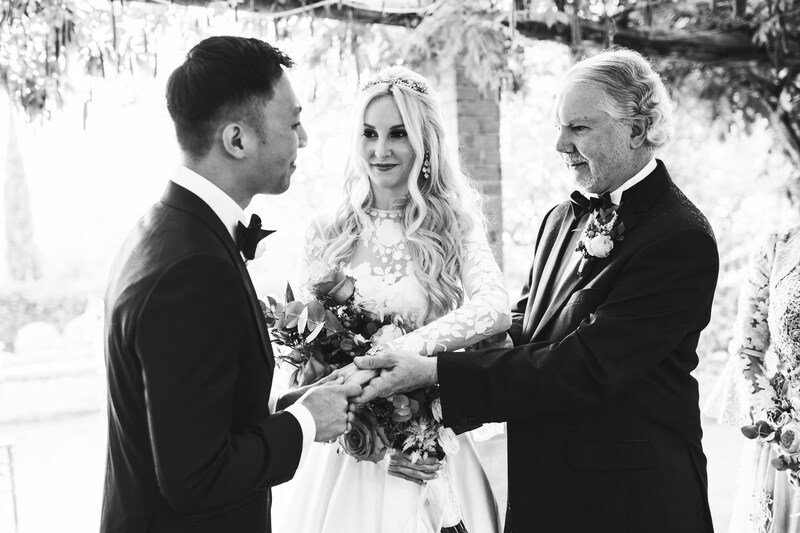 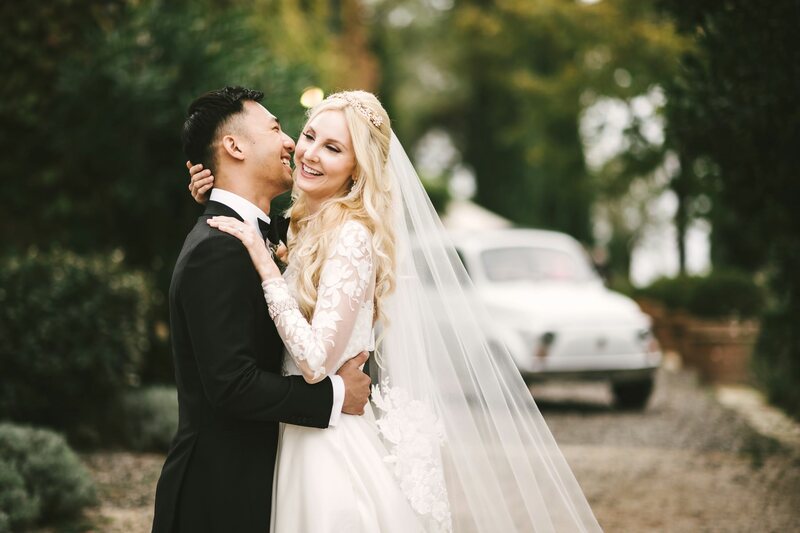 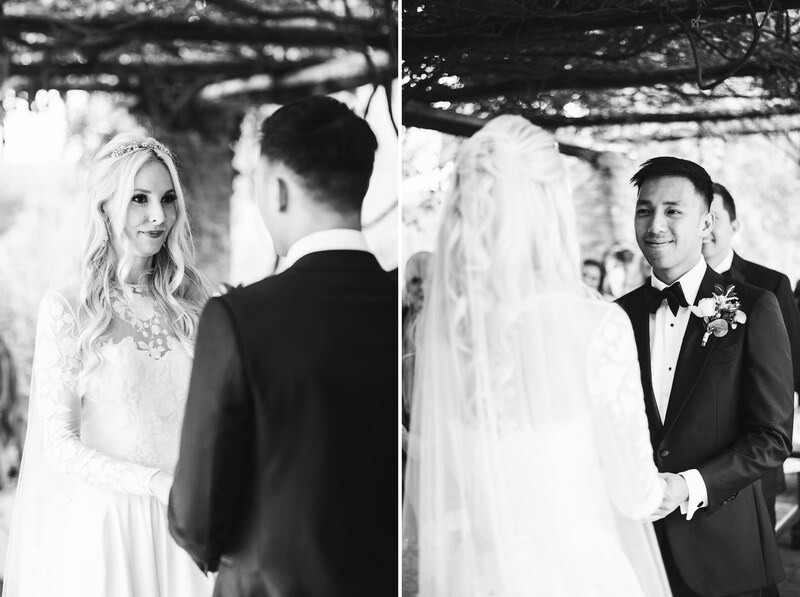 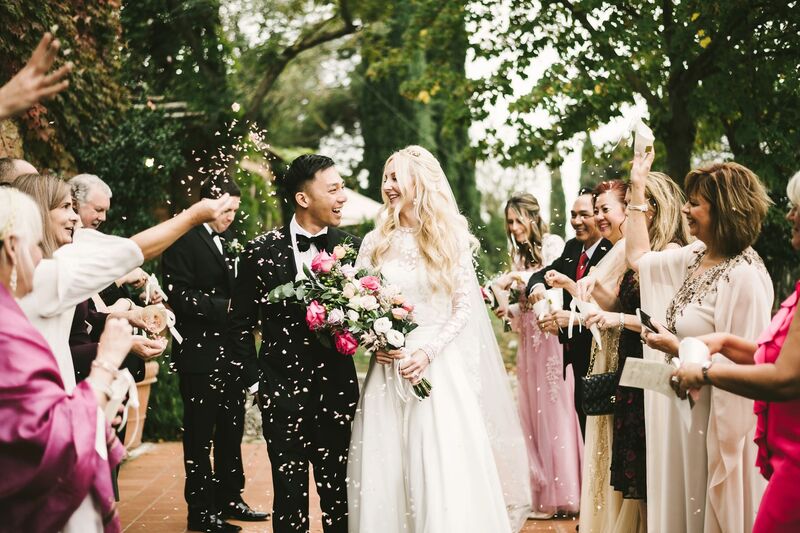 Most importantly, though, Ashley and Huy didn’t let this accident ruin their special day: the celebration was absolutely touching and packed with positive feelings! 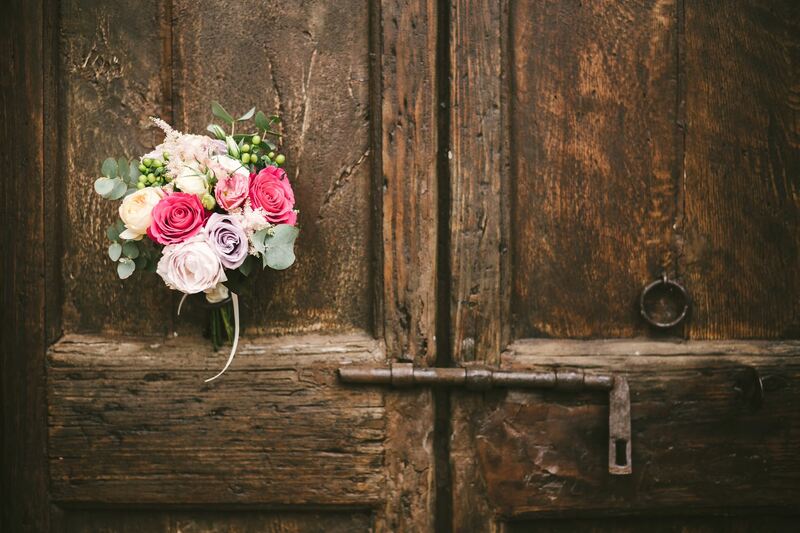 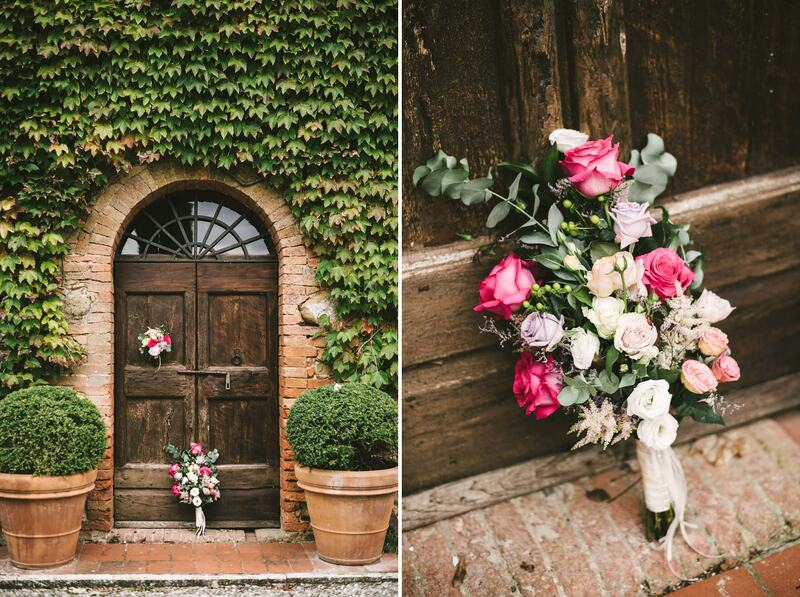 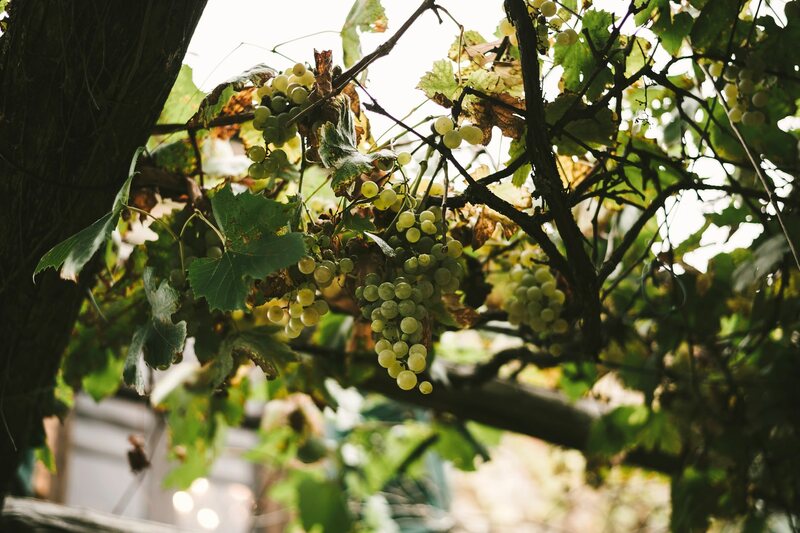 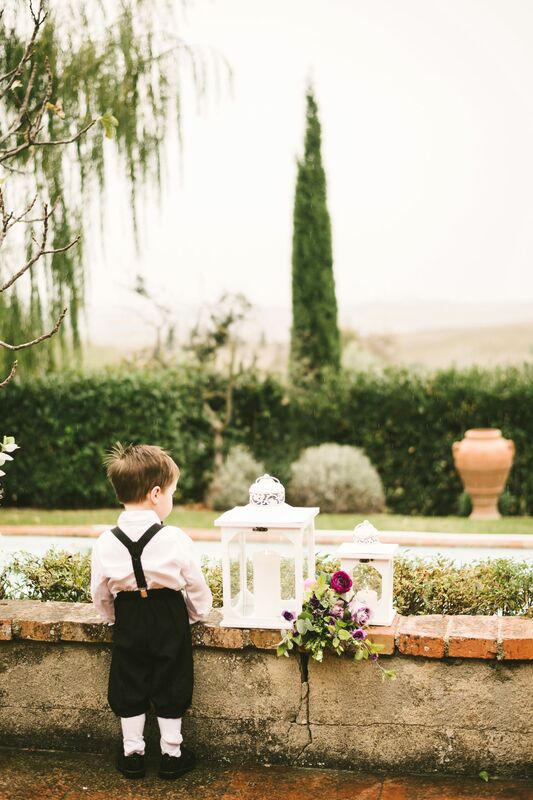 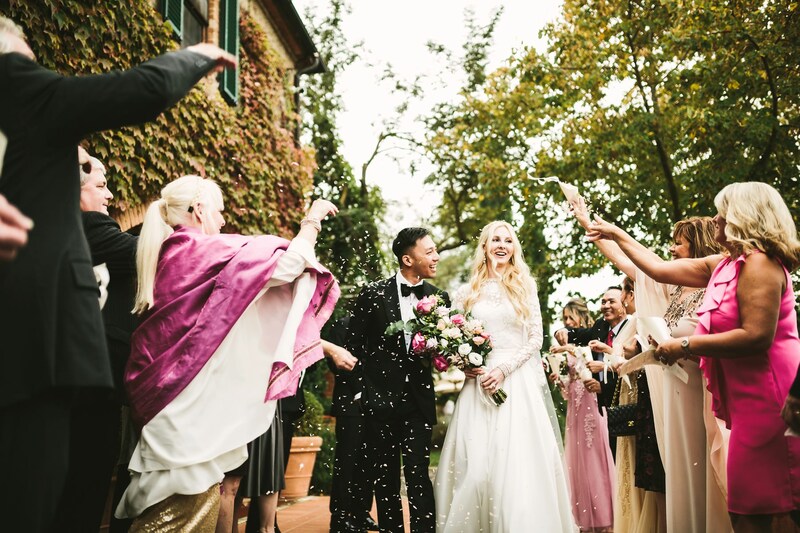 Although Italy is considered an overall sunny country, it could happen that it rains over your destination wedding. 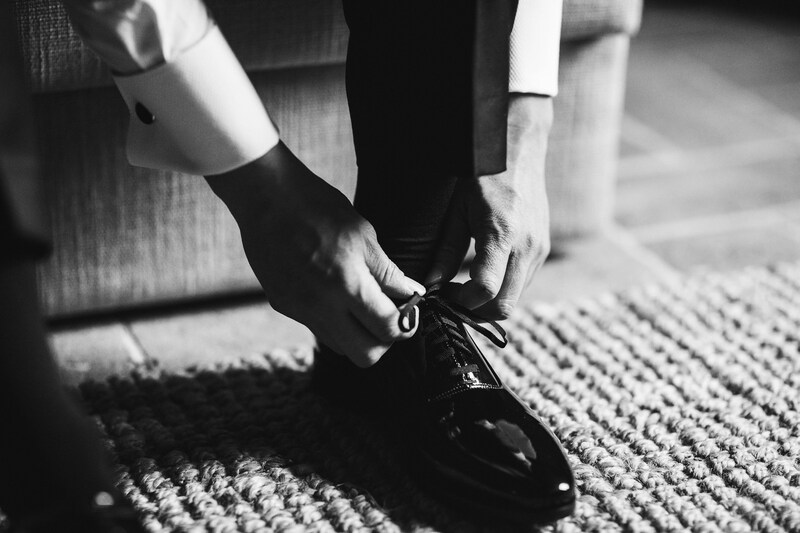 No panic, though – actually, this can turn into an opportunity! 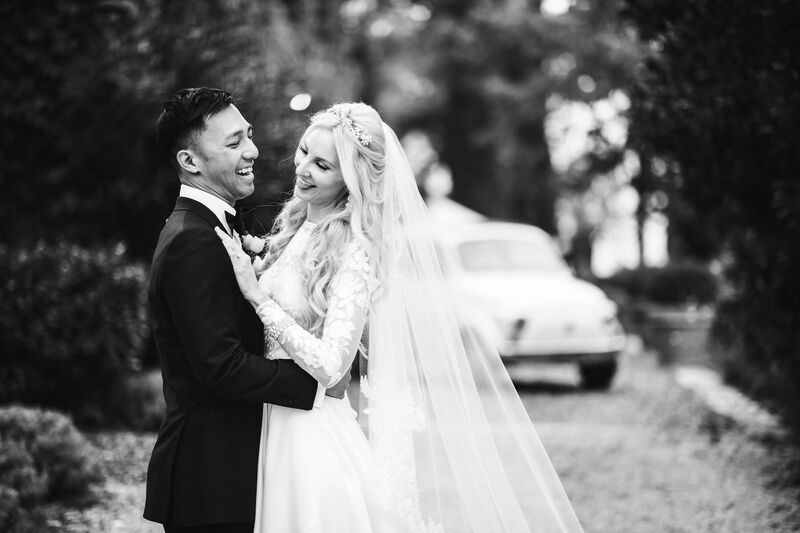 That’s what happened with Ashley and Huy’s celebration: thanks to the rain, the light was ideal for photos – pale and soft, gentle and ethereal. 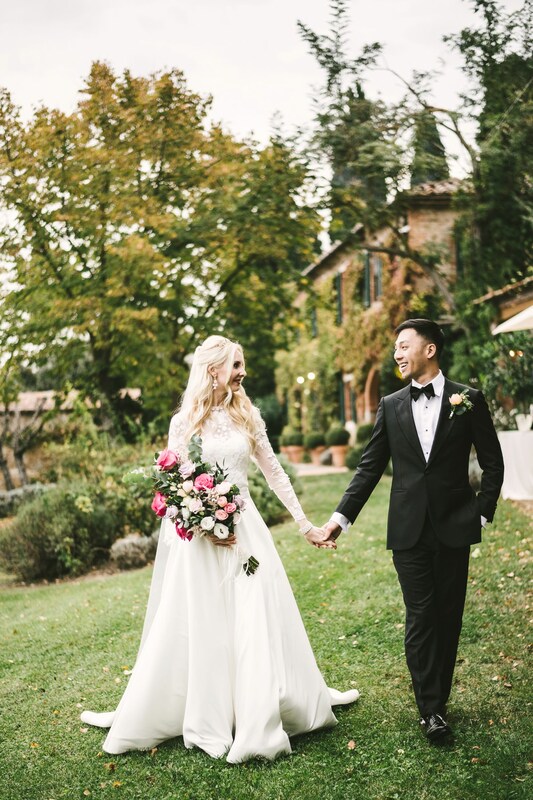 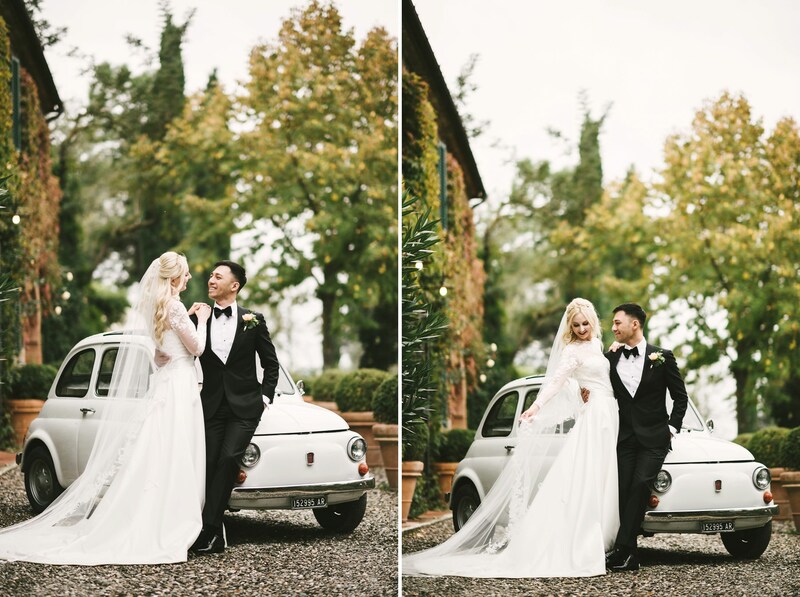 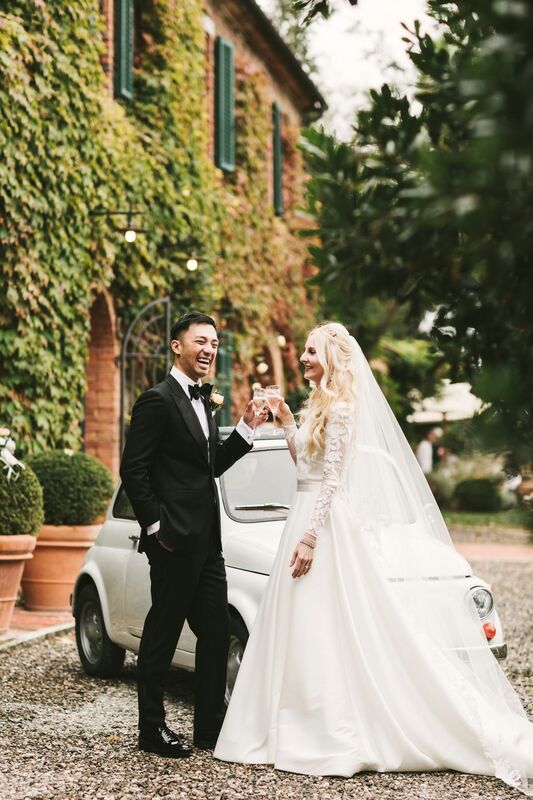 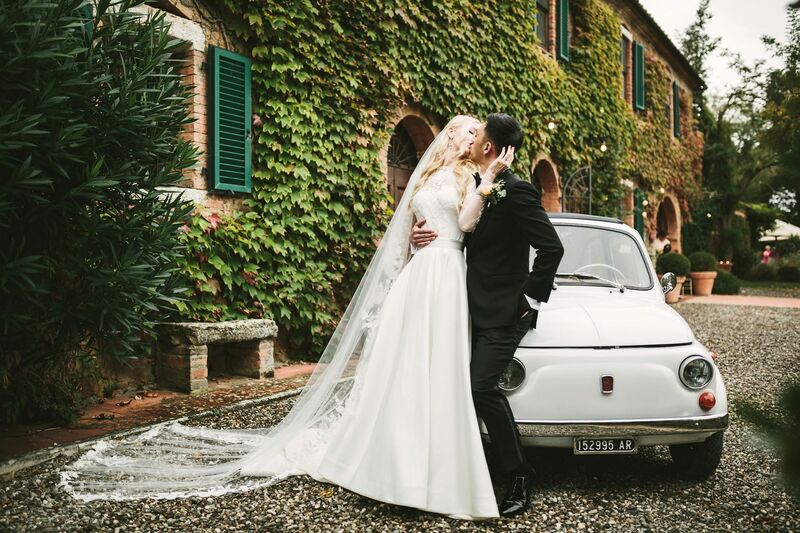 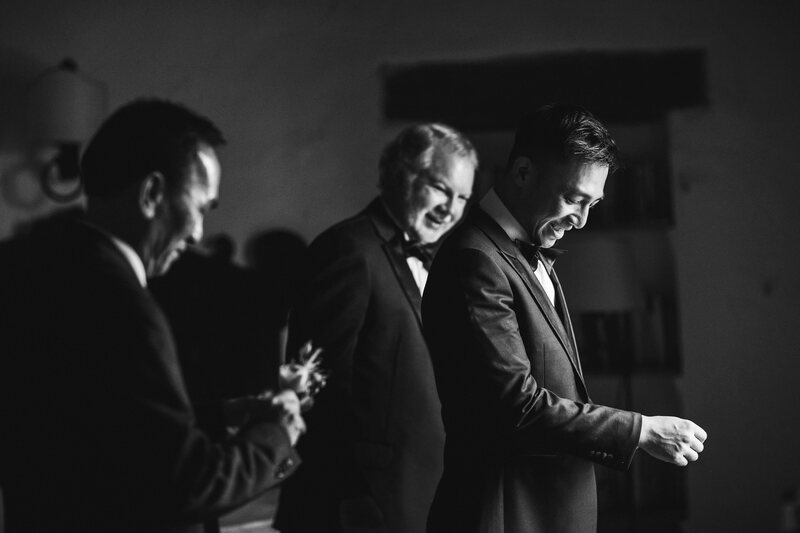 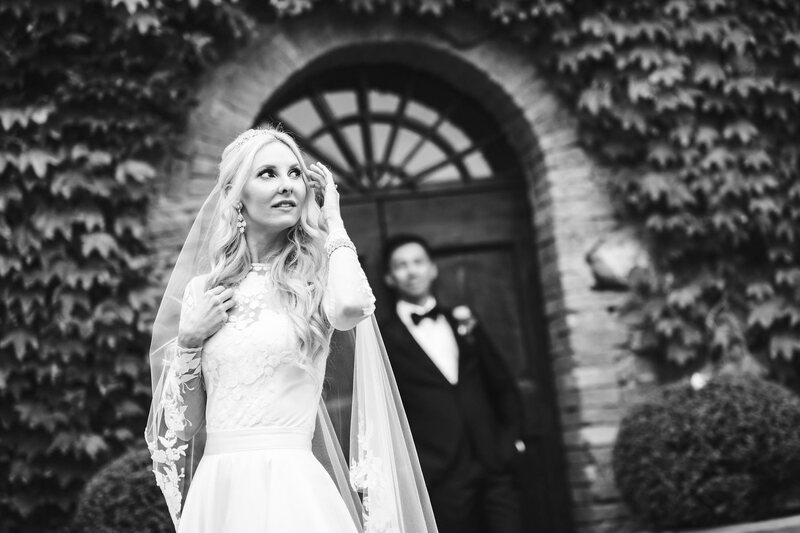 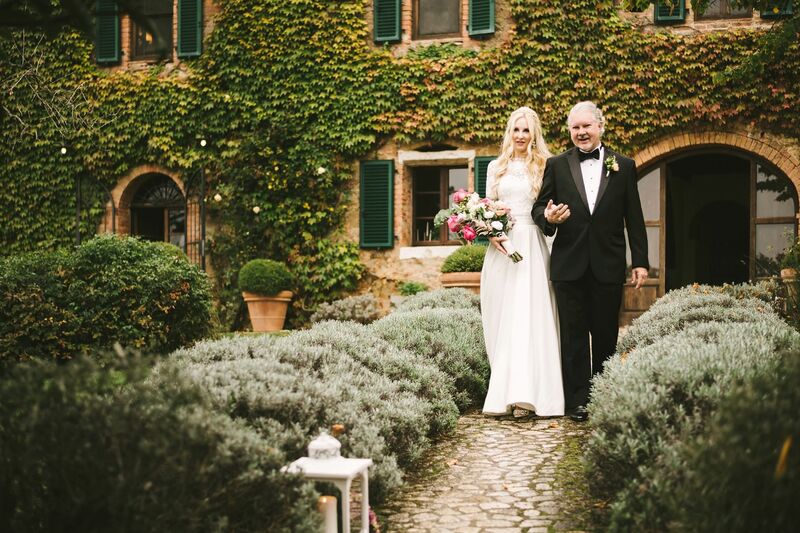 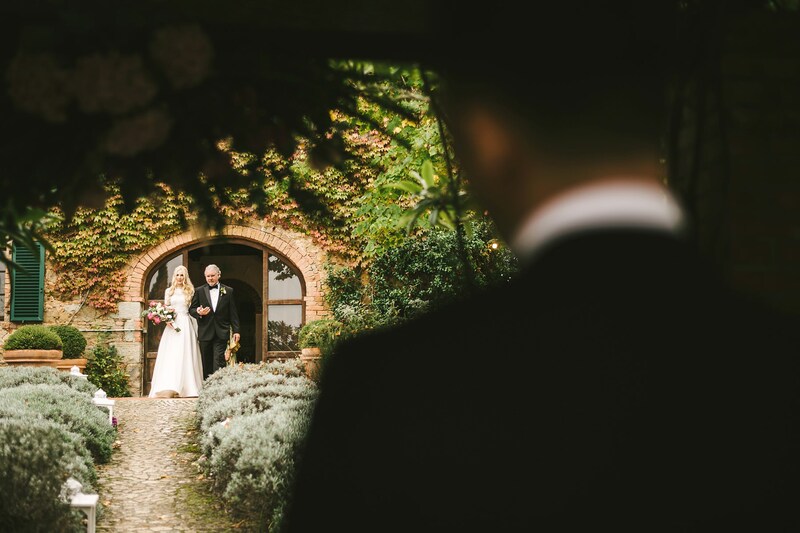 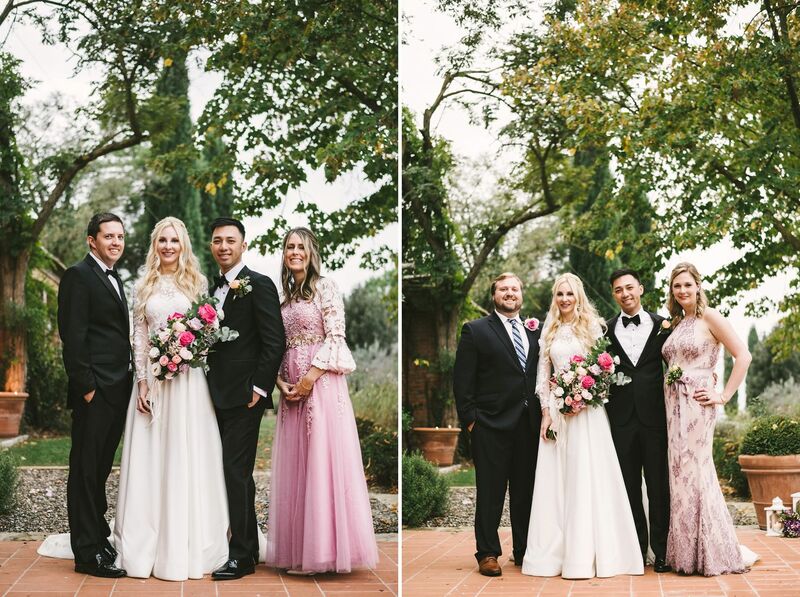 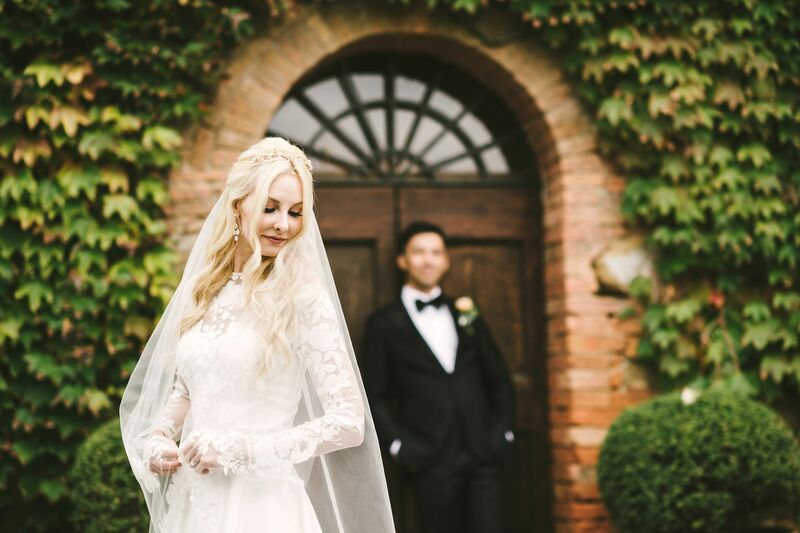 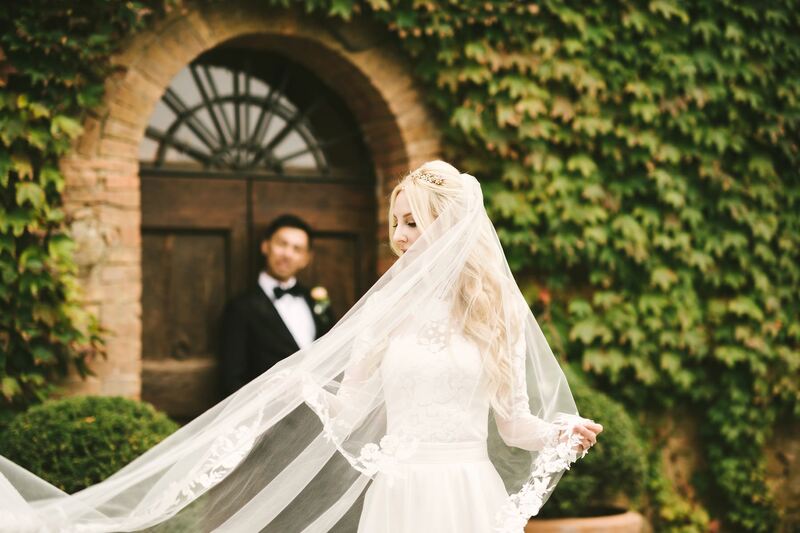 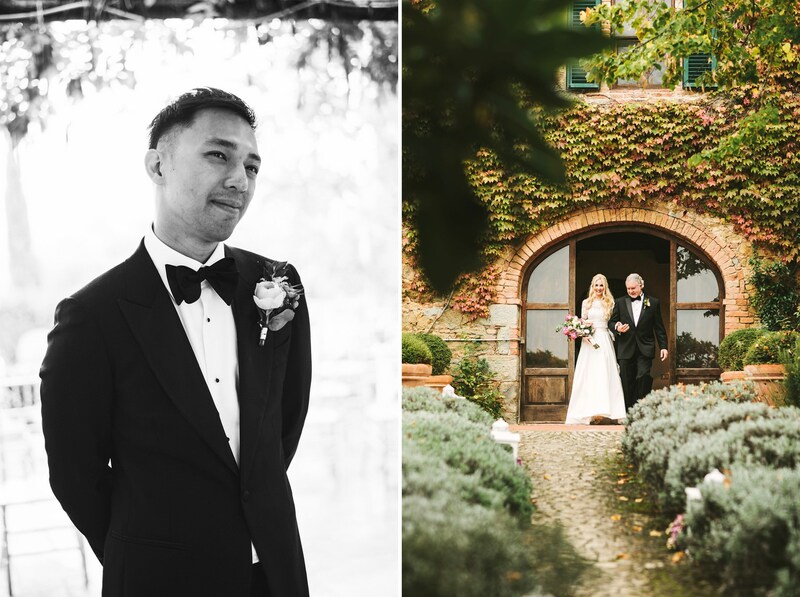 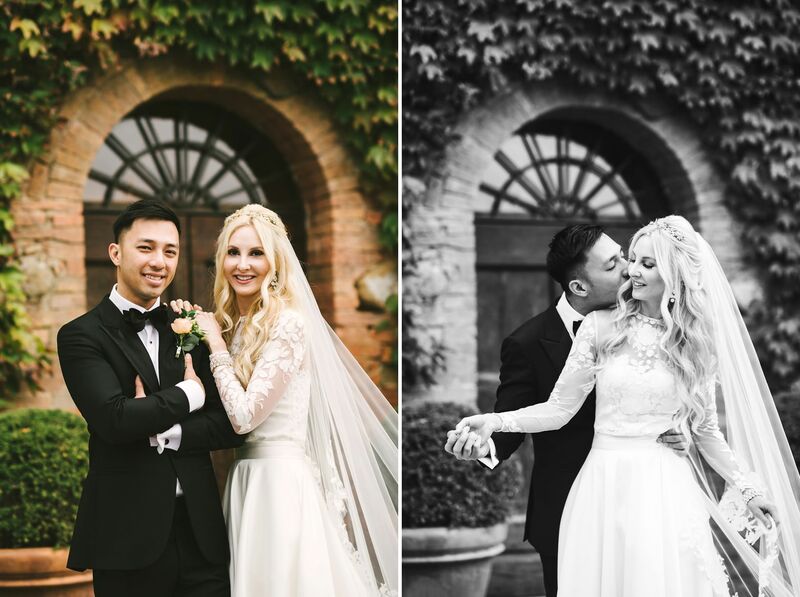 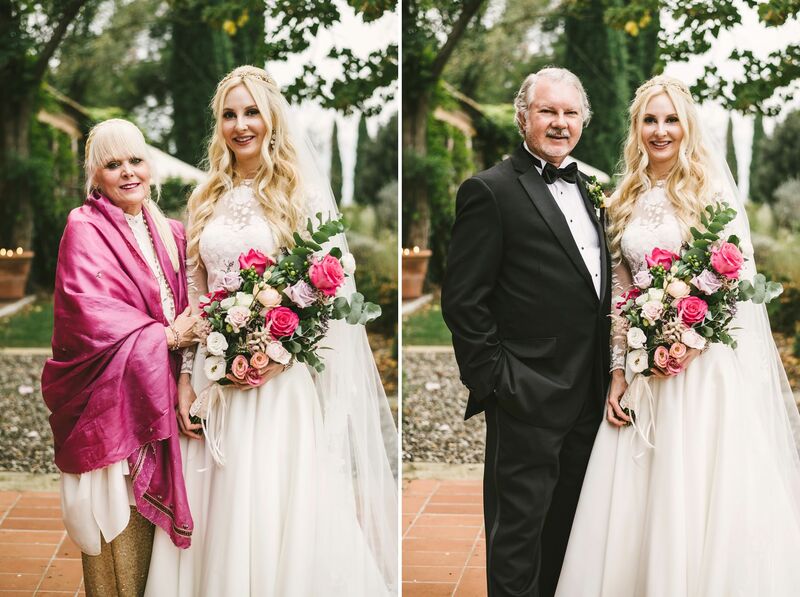 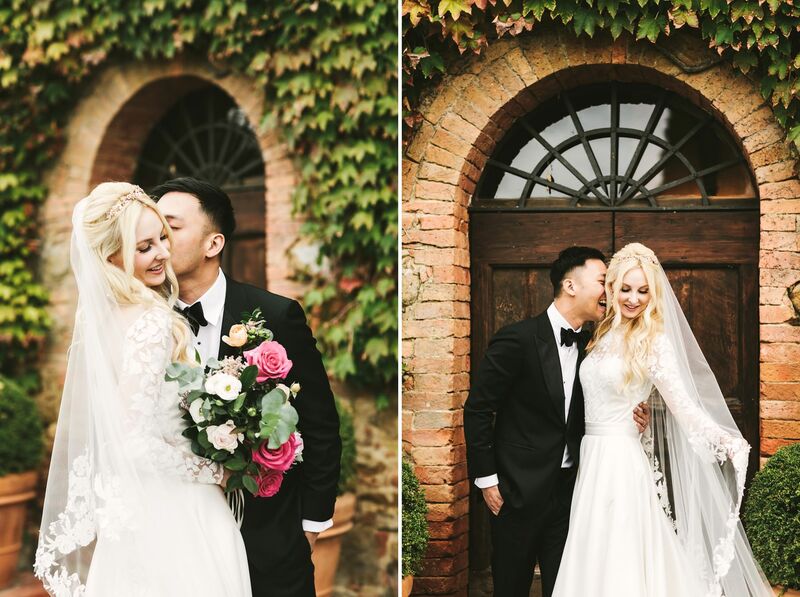 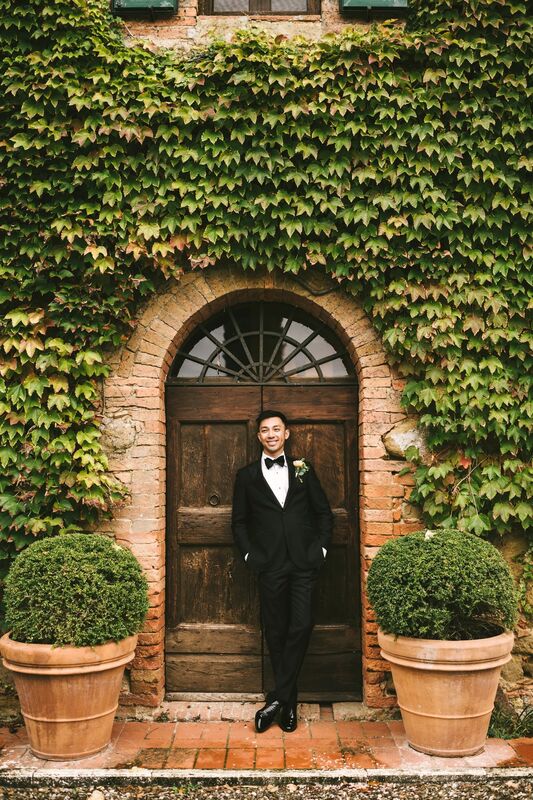 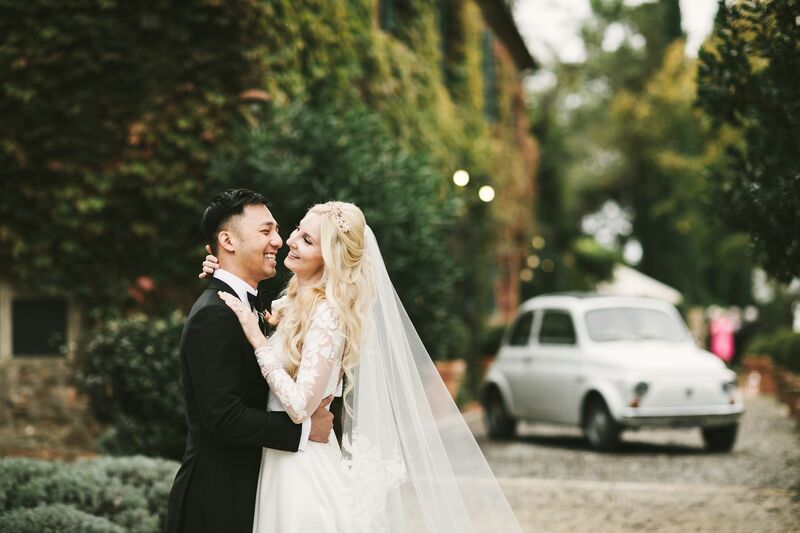 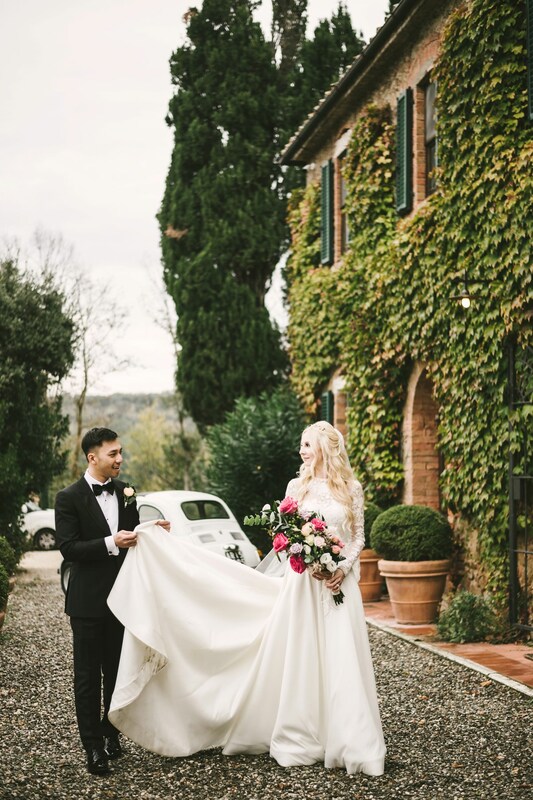 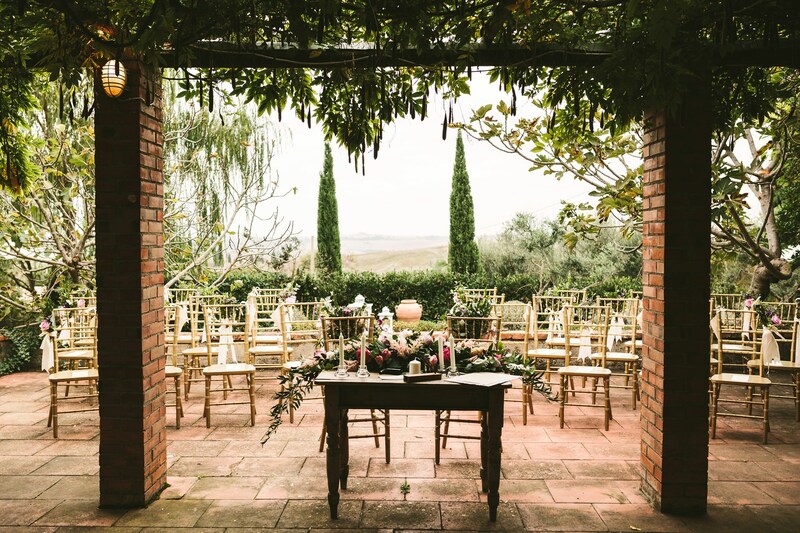 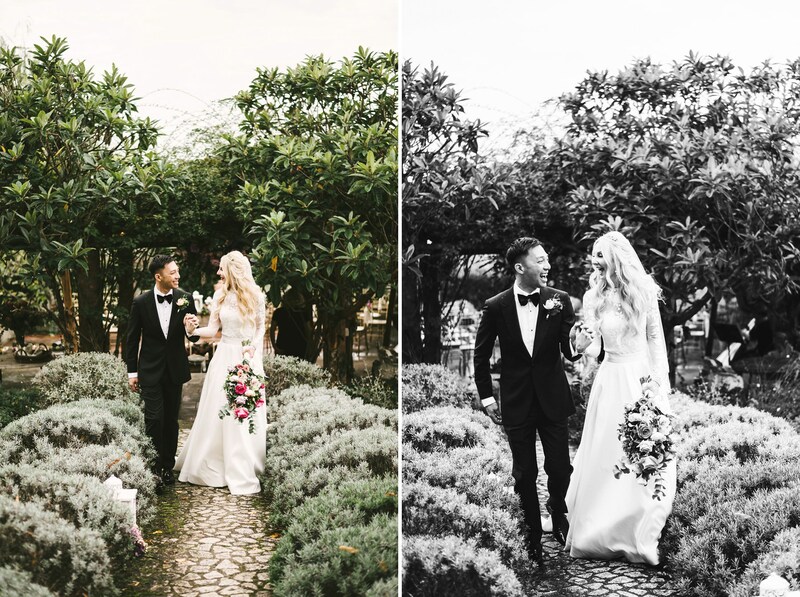 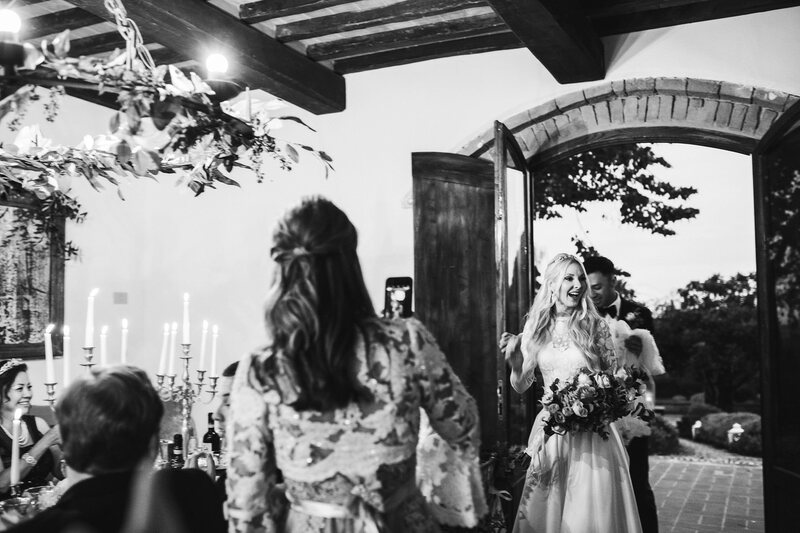 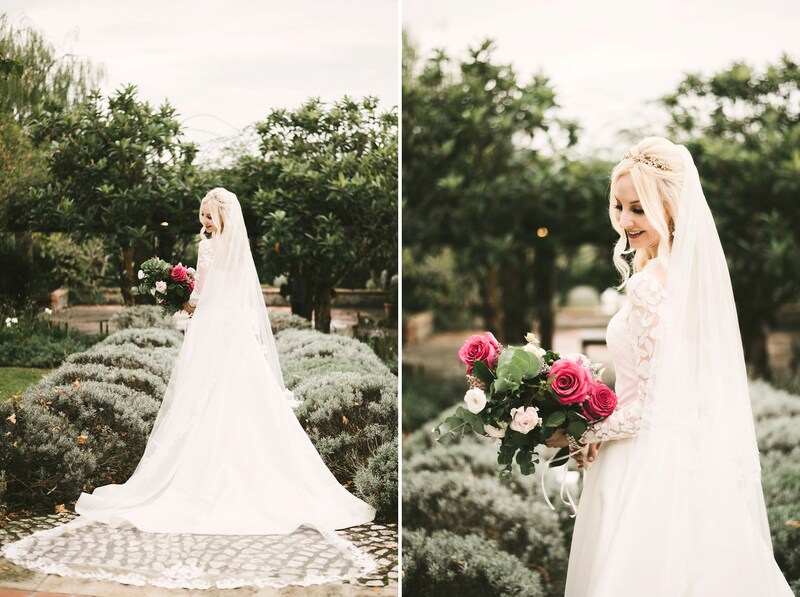 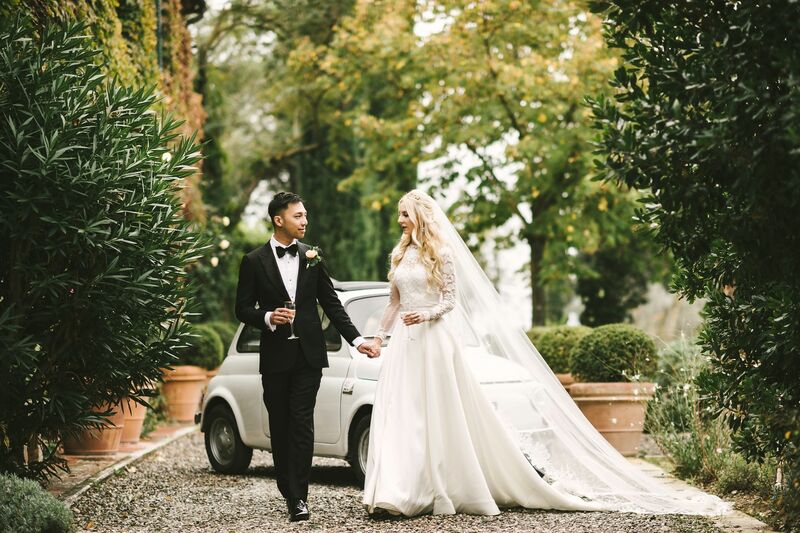 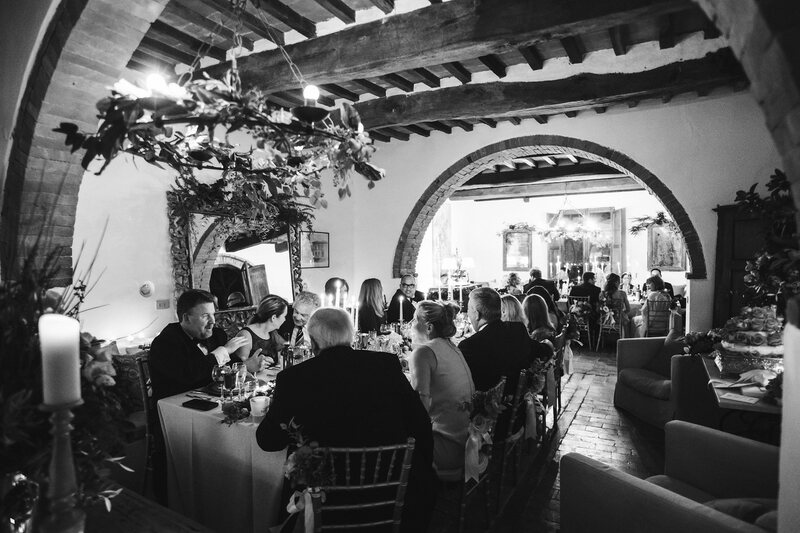 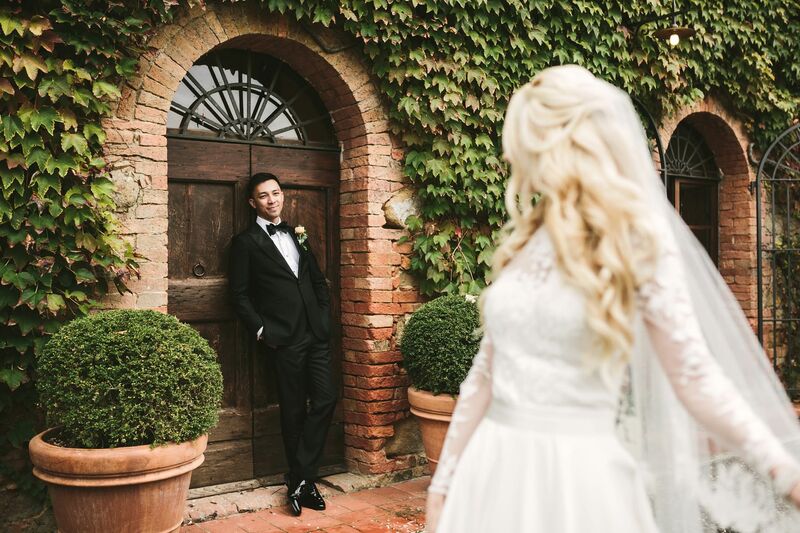 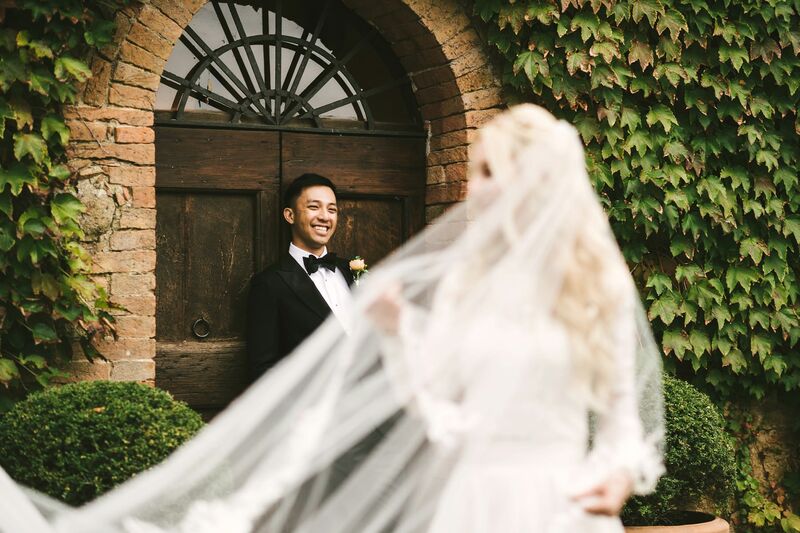 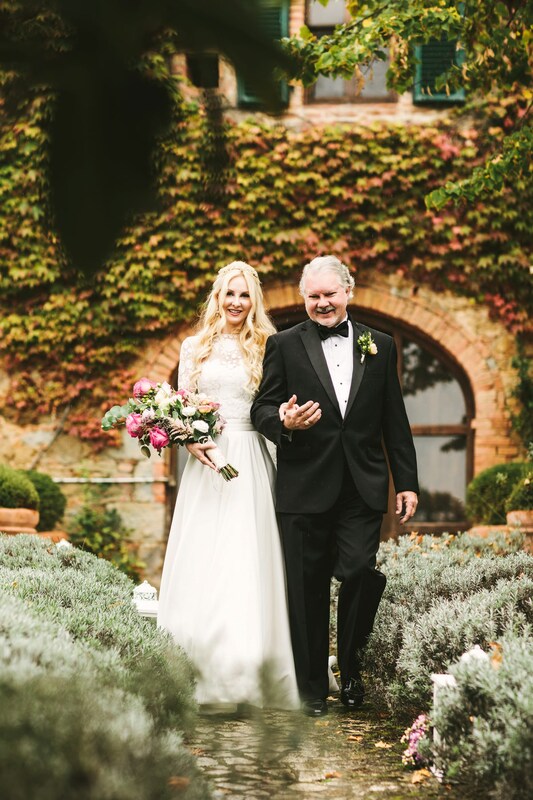 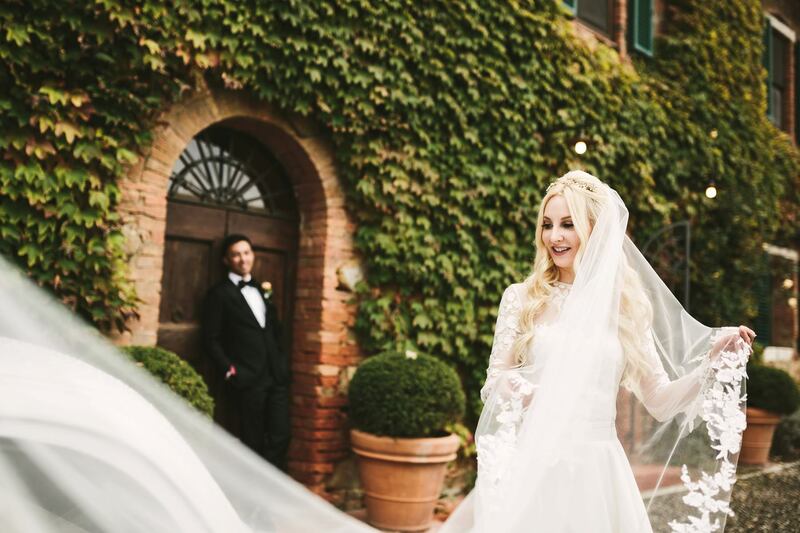 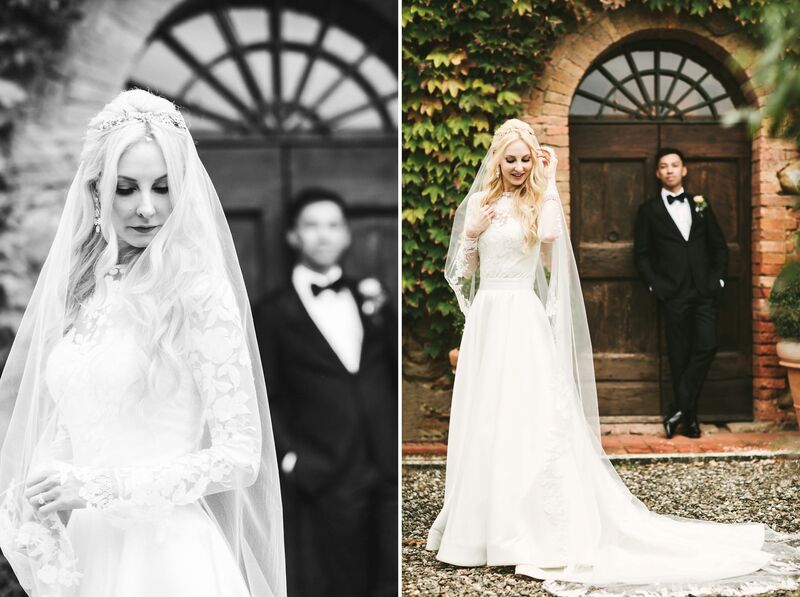 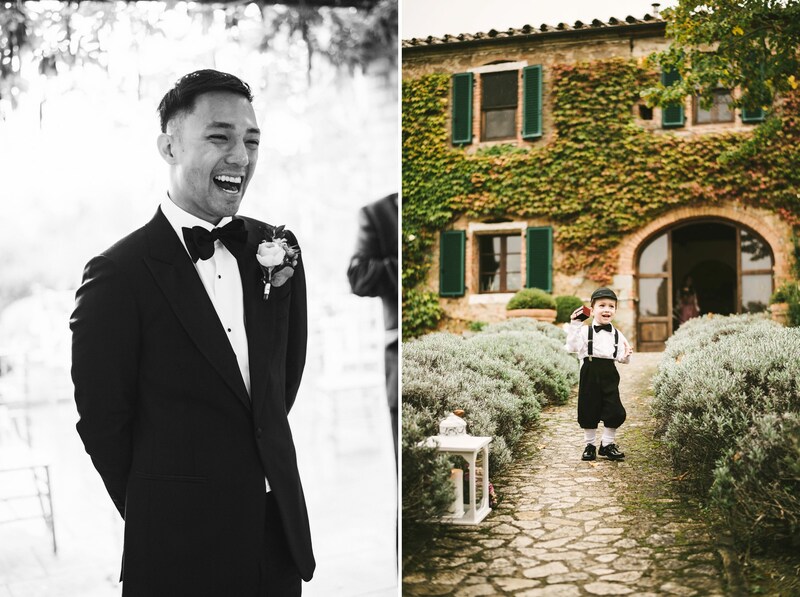 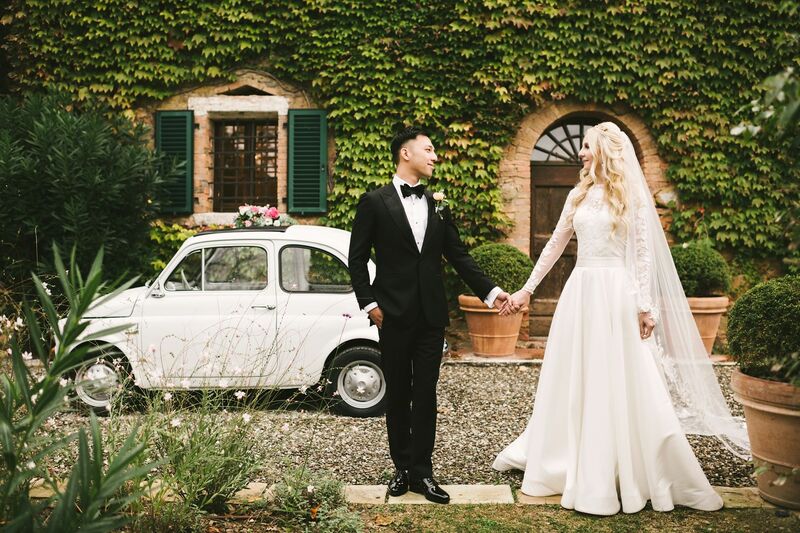 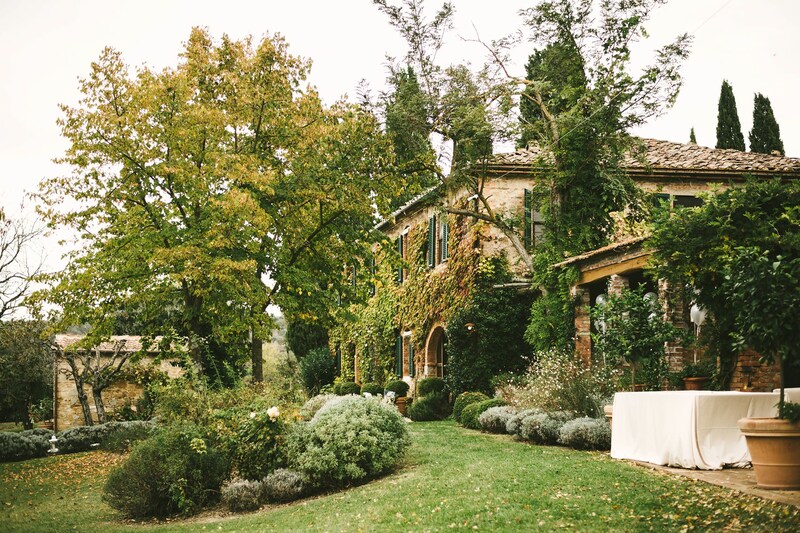 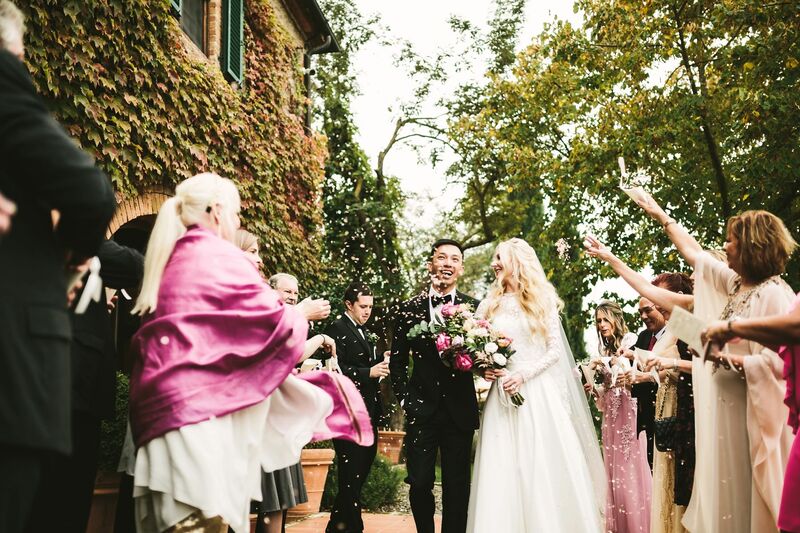 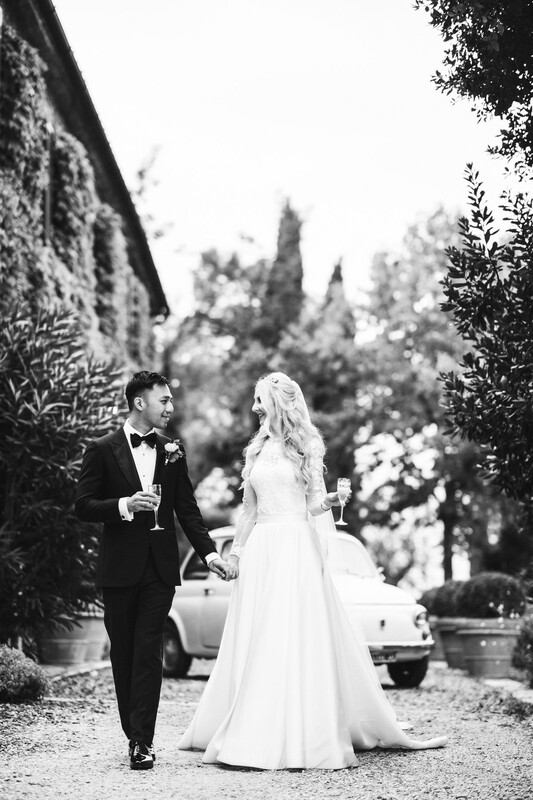 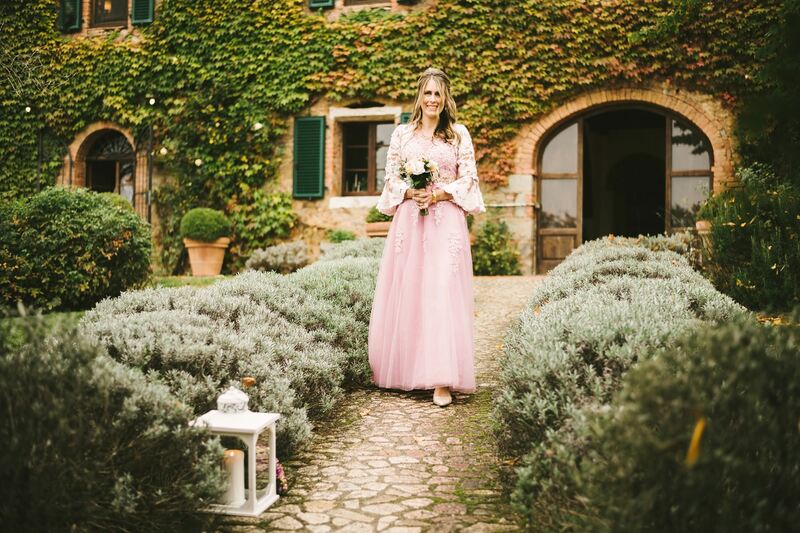 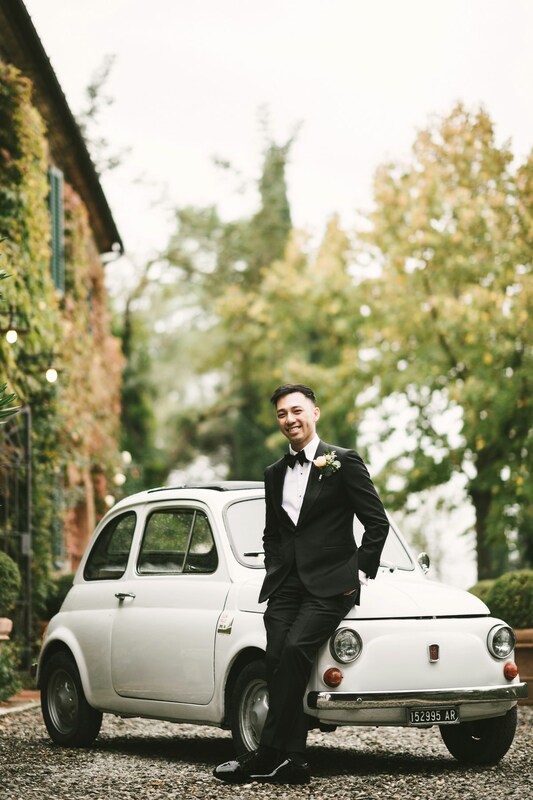 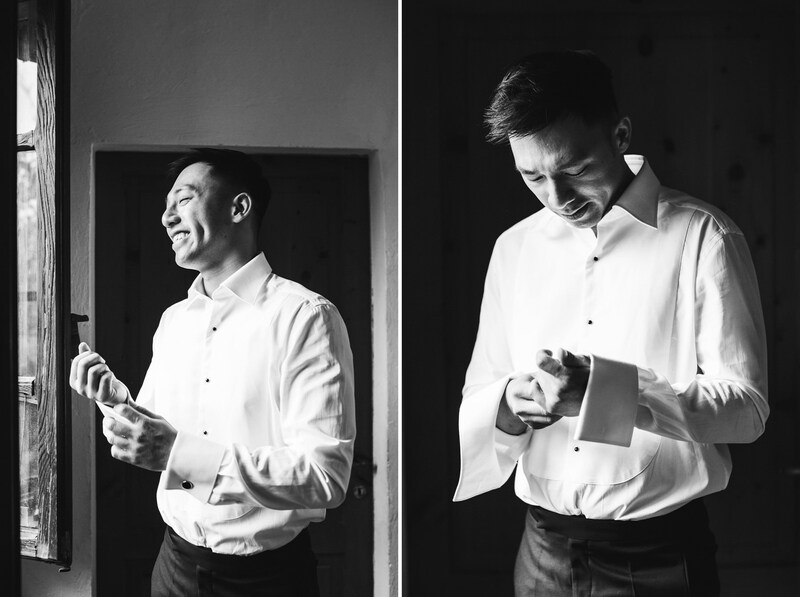 At the same time, the green of the Tuscan hills got even more intense and the pictures of the newlyweds in the countryside turned out to be absolutely magical. 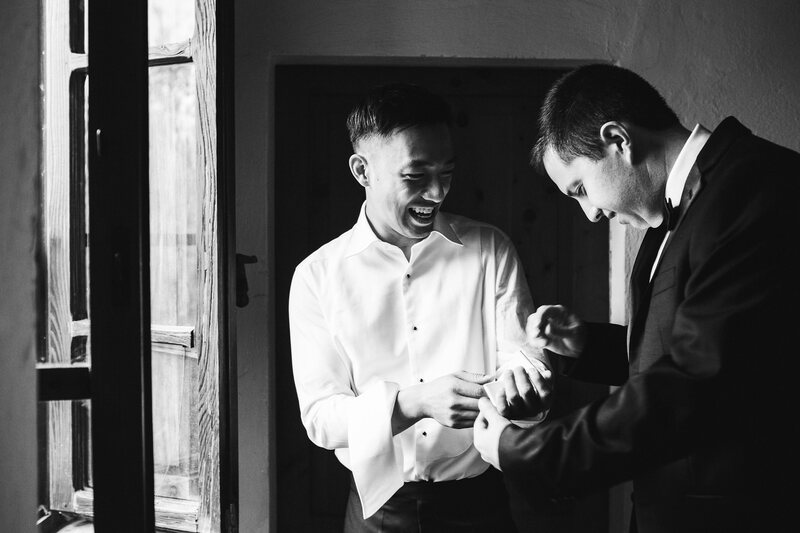 This is just a simple example of how a negative event could actually turn into a positive one – even on your most precious day. 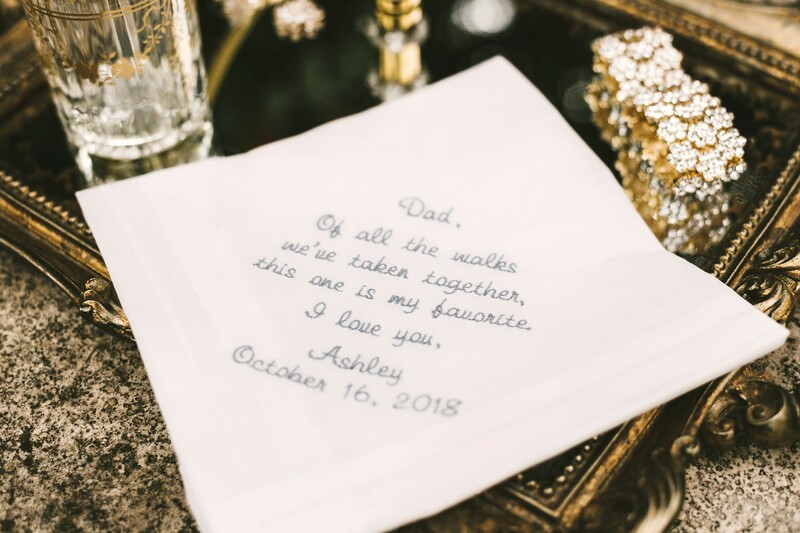 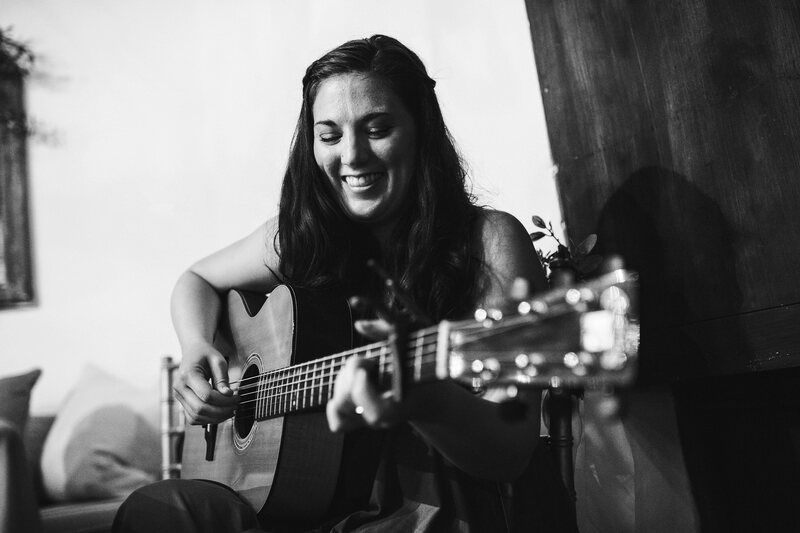 Your elegant wedding won’t go bad just because of a little rain: that will actually be one of the things that will make it even more unique!